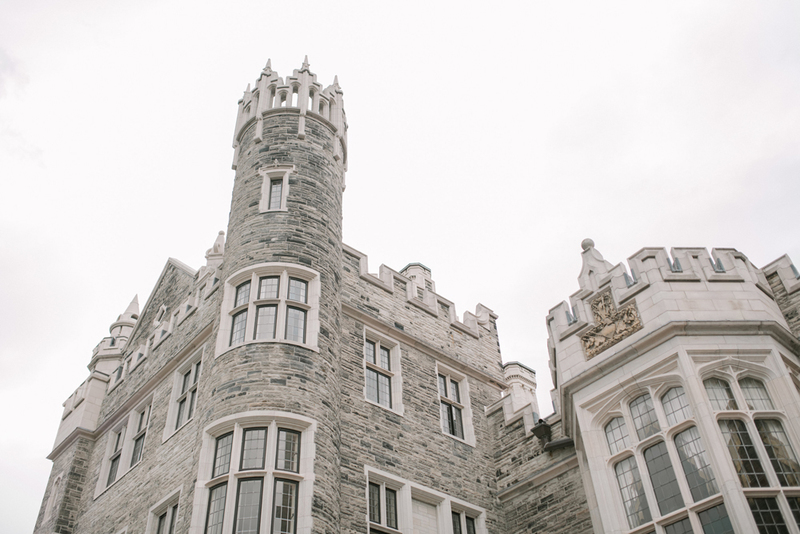 What do you get when you combine amazing food and wine, 200 of your closest family members and friends at Casa Loma in Toronto? 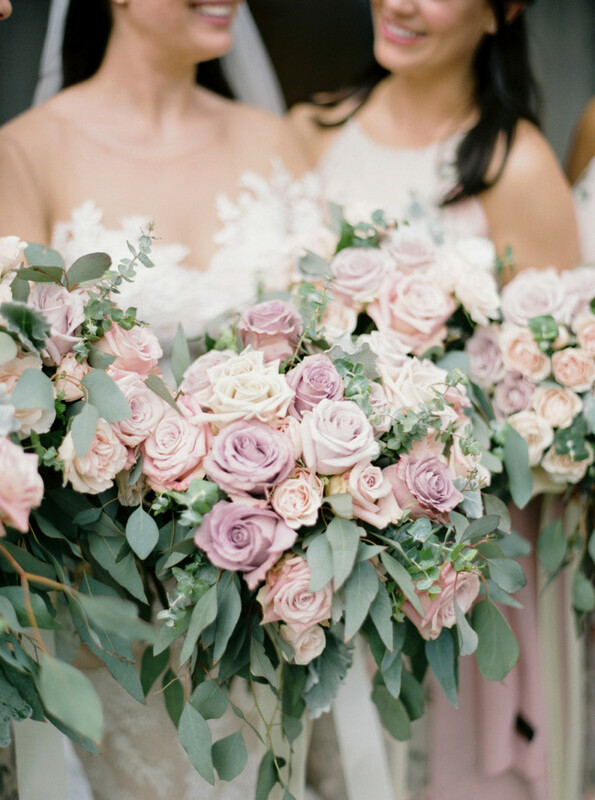 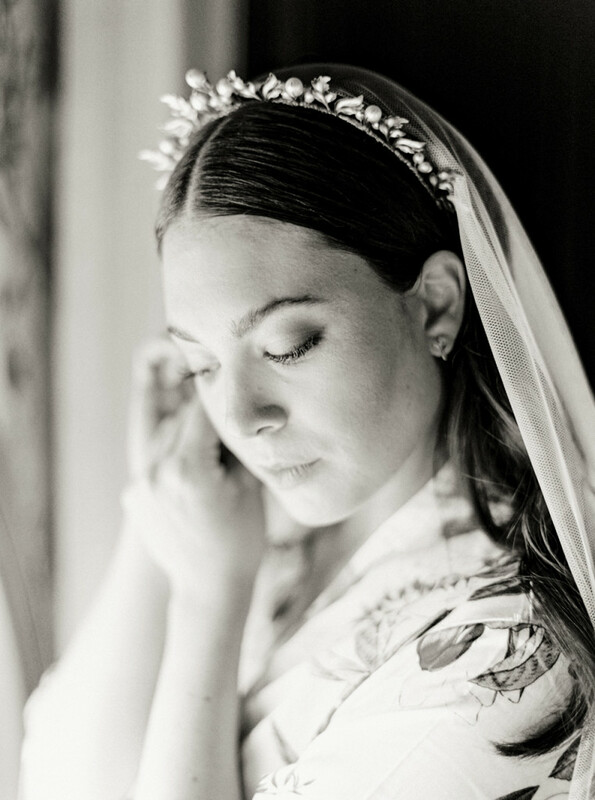 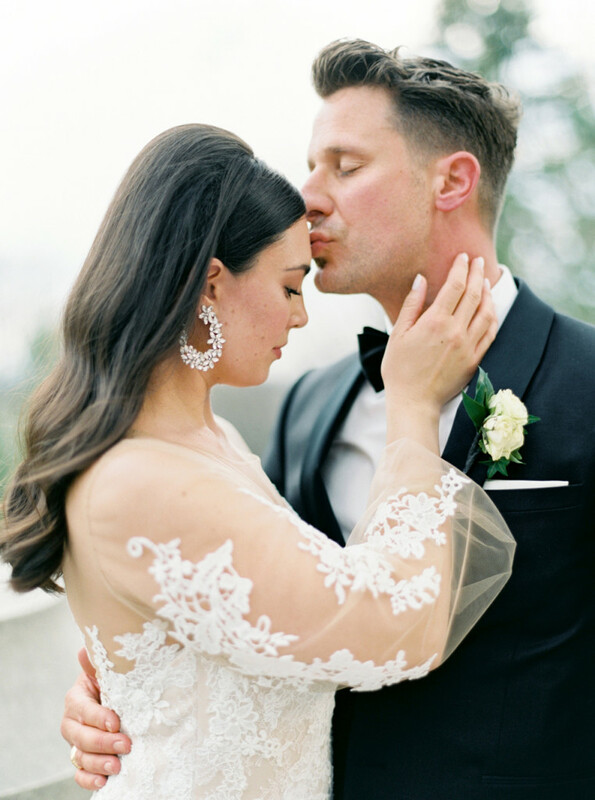 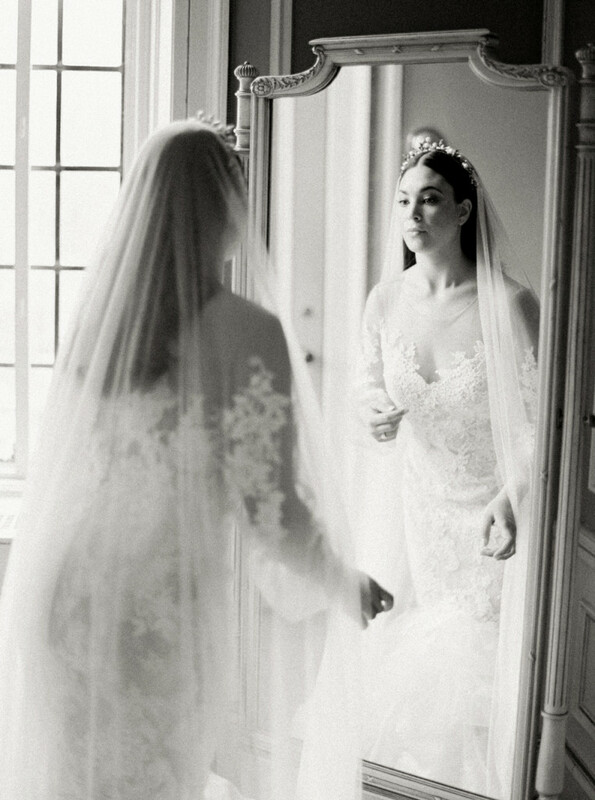 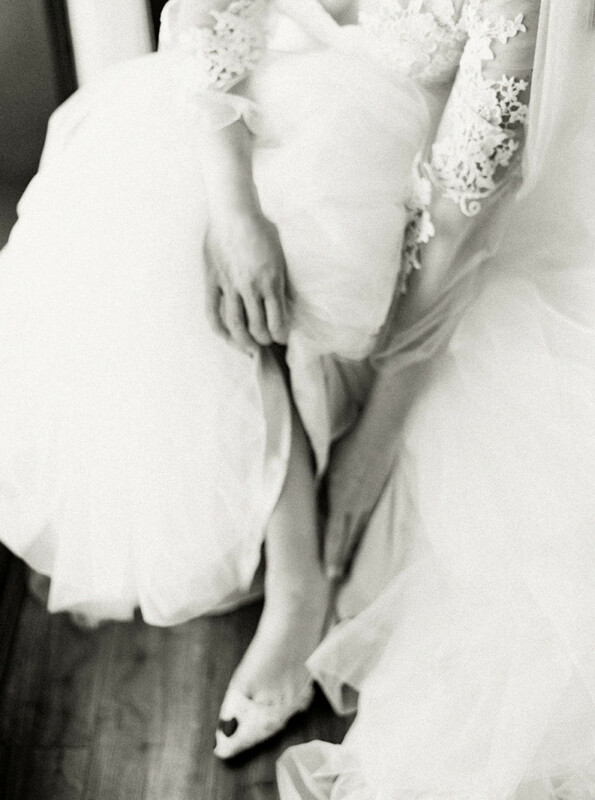 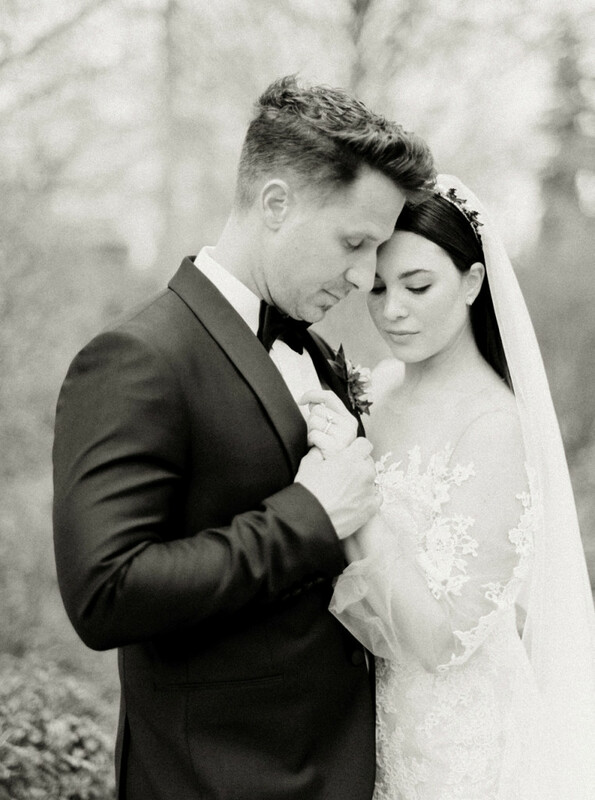 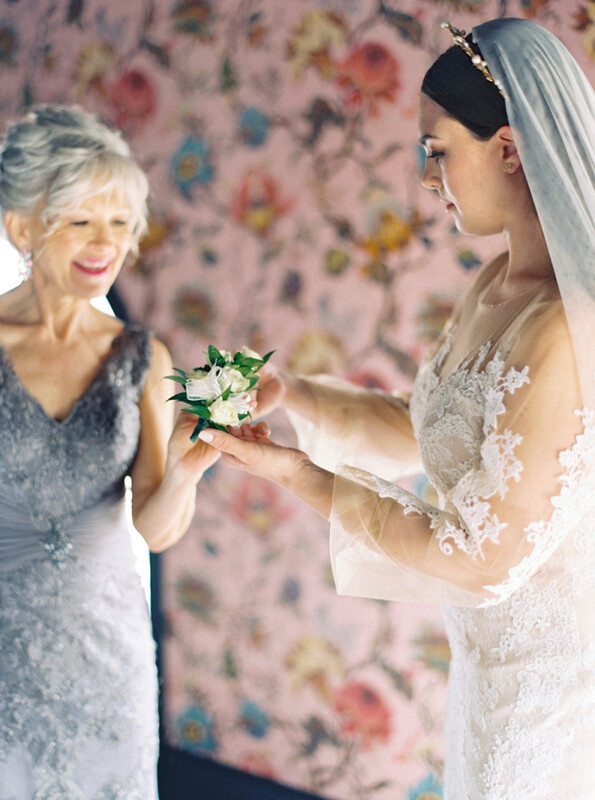 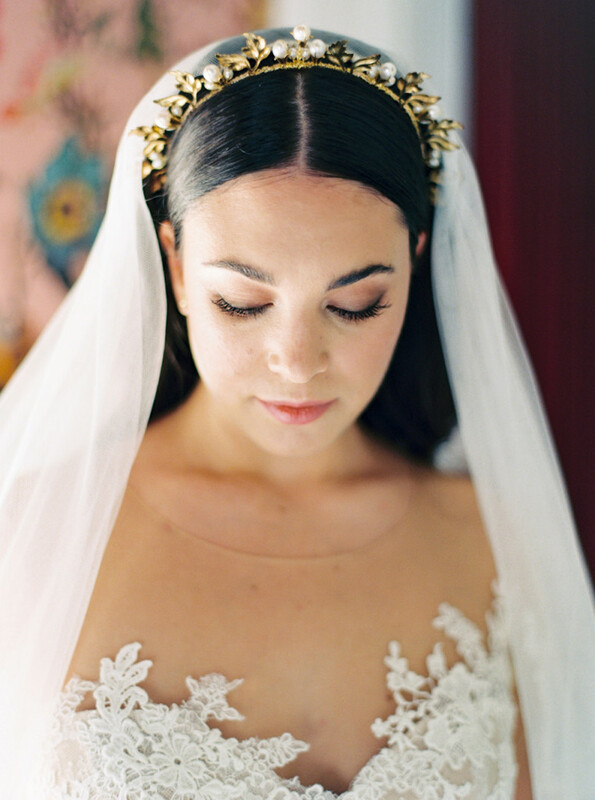 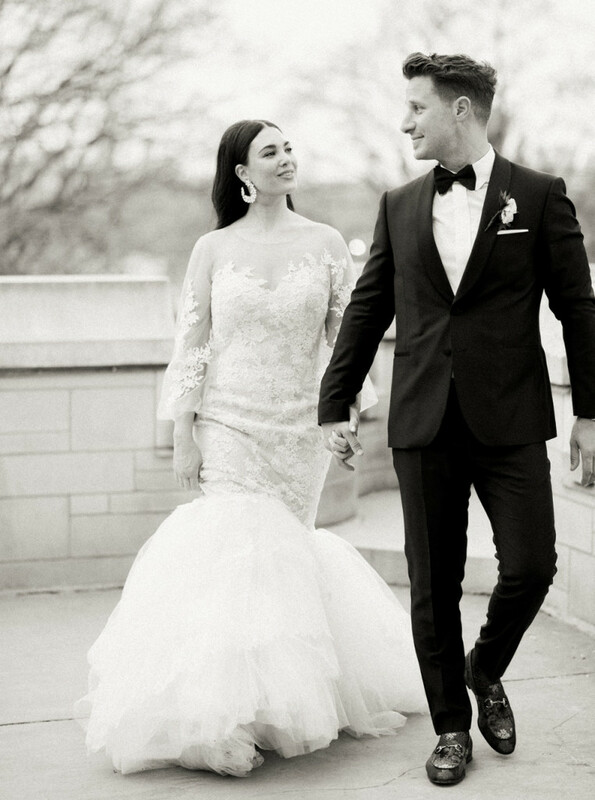 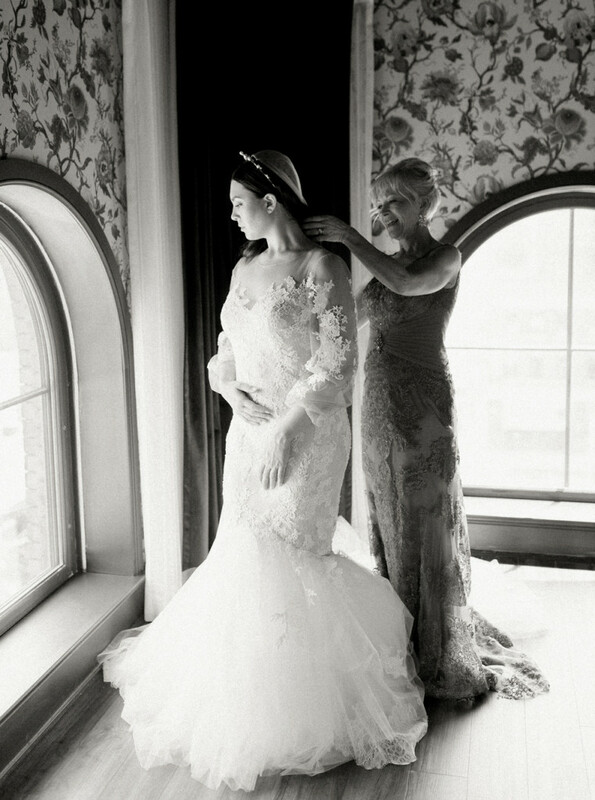 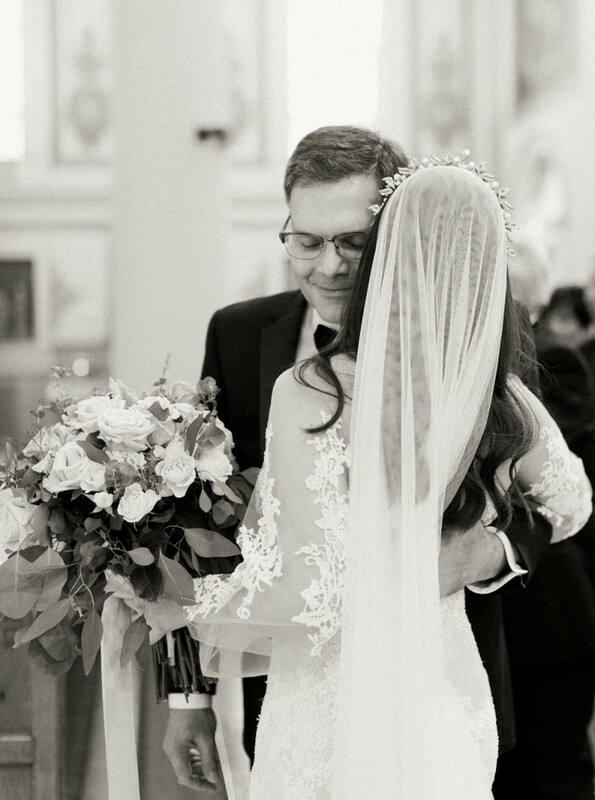 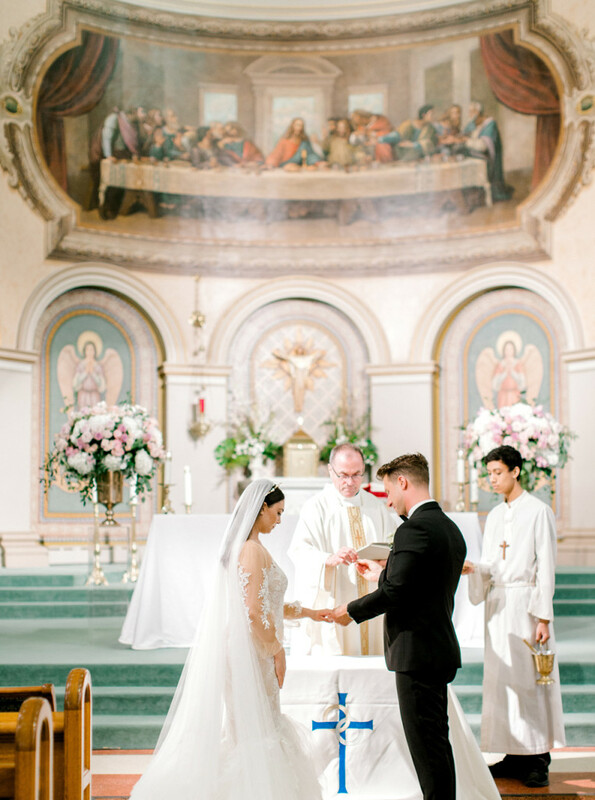 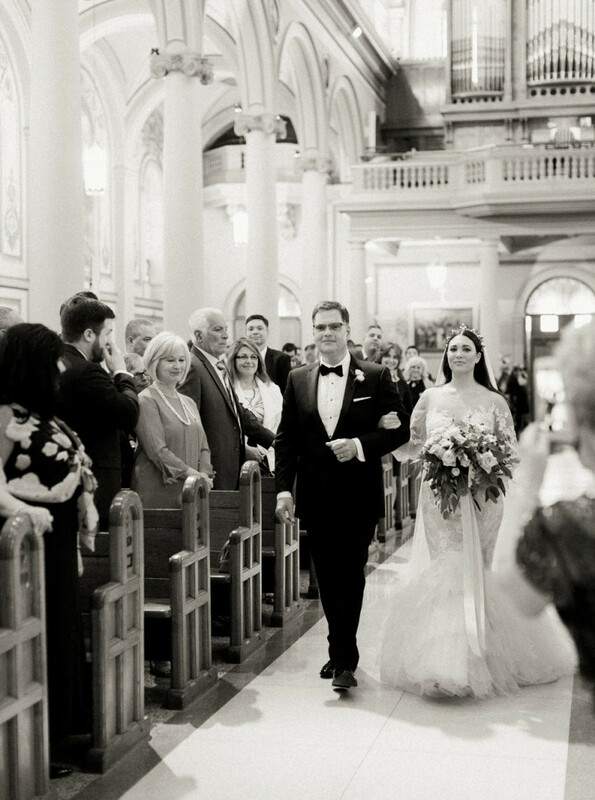 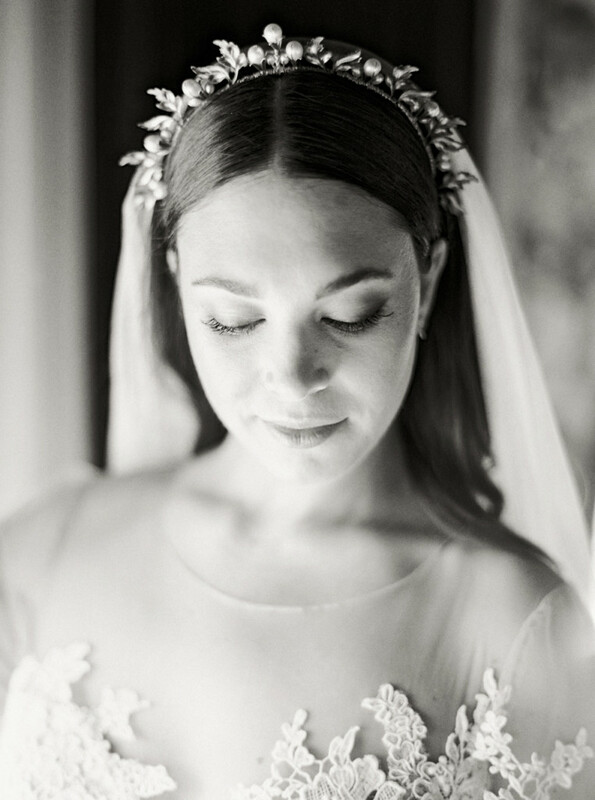 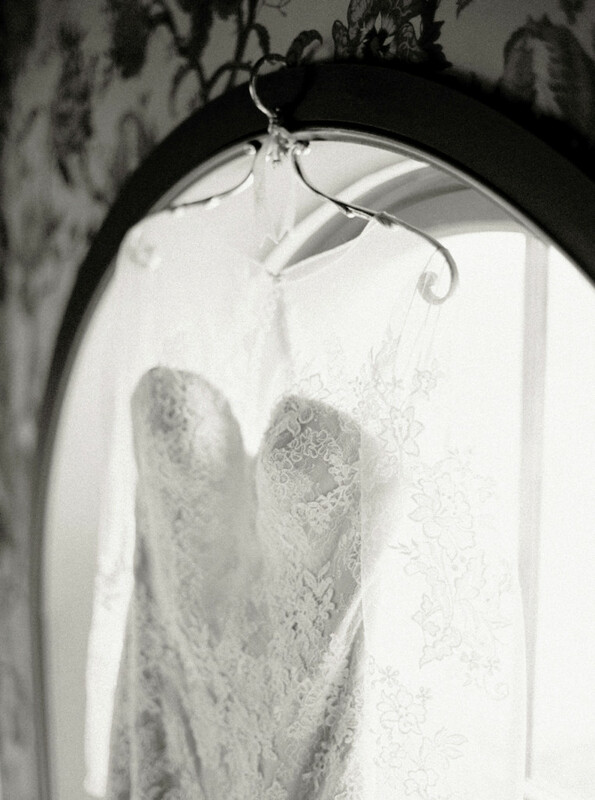 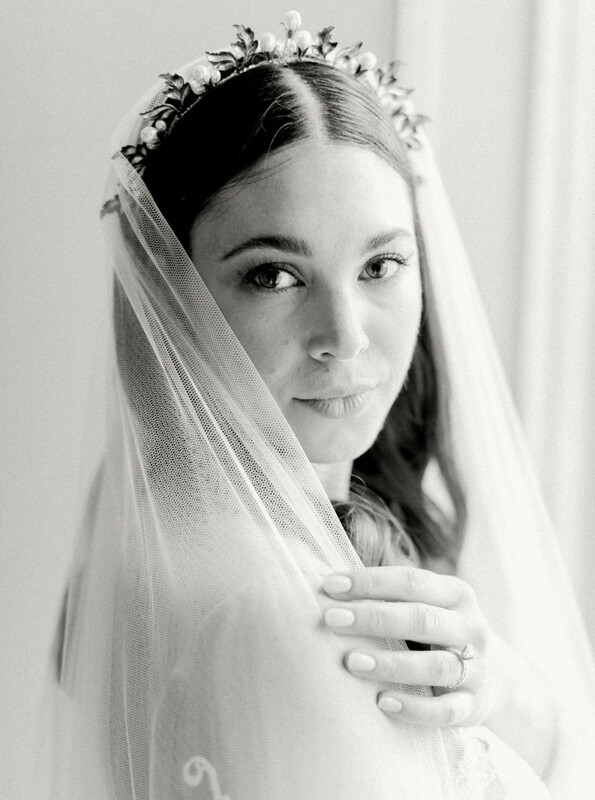 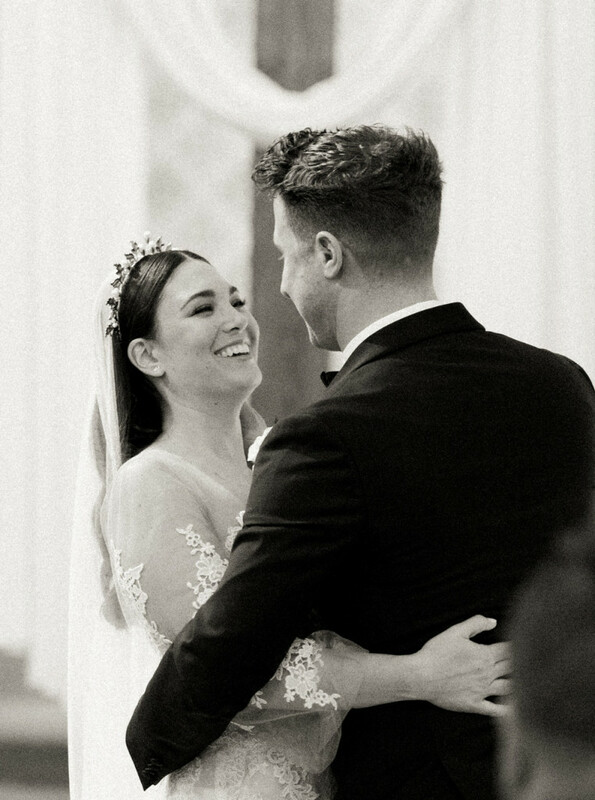 The most beautiful, memorable Italian wedding! 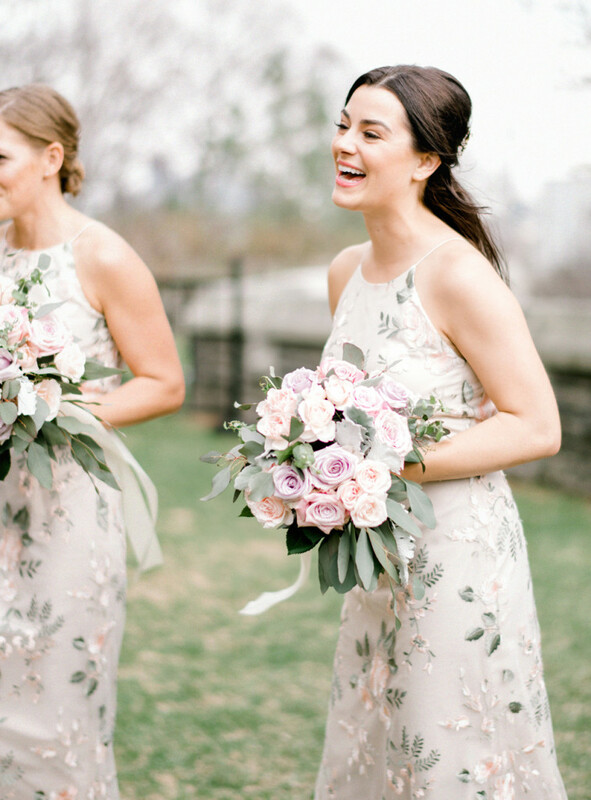 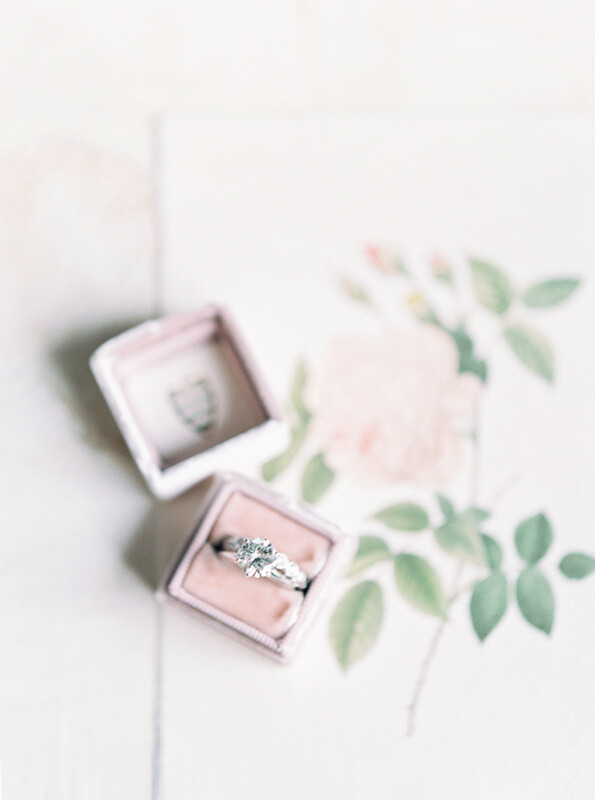 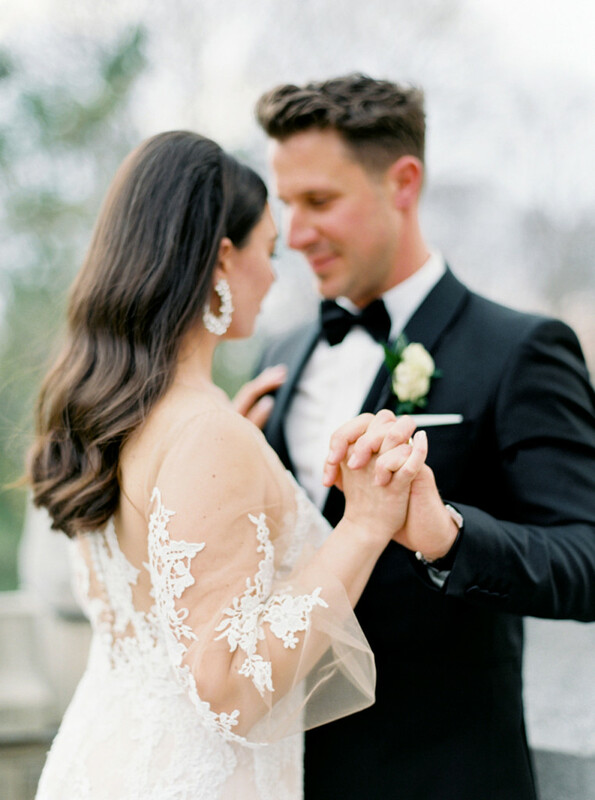 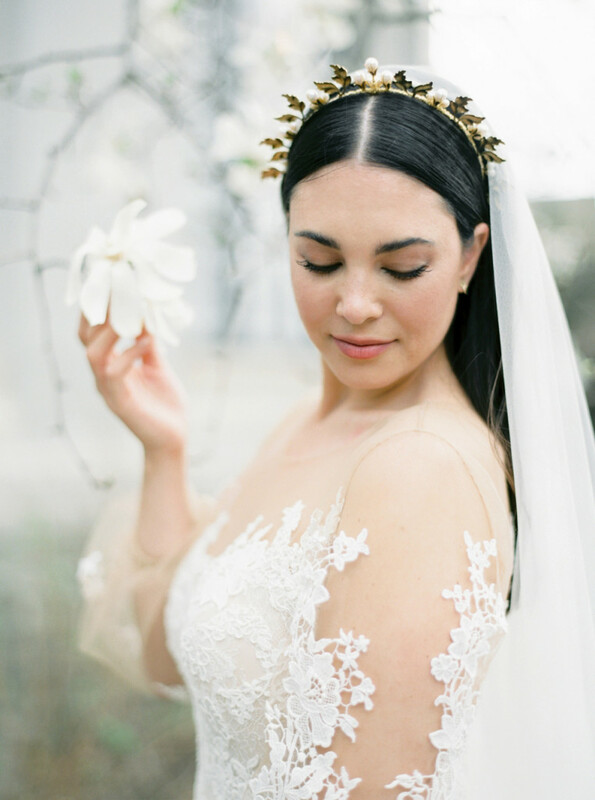 Olivia and Marco were married in the first few weeks of Spring, just as the magnolia trees began to bloom. 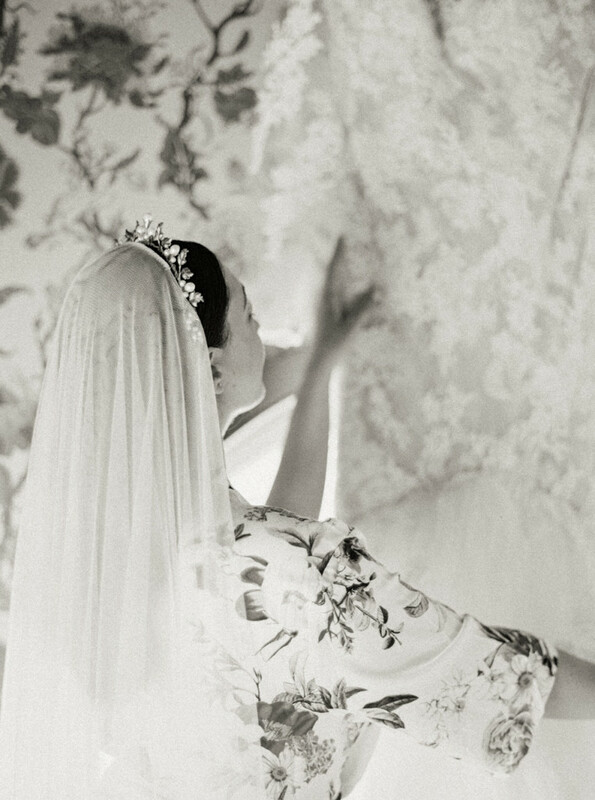 During the early design stages, as we were first exploring ideas and inspiration, it became very clear that ‘everything floral’ was our theme. 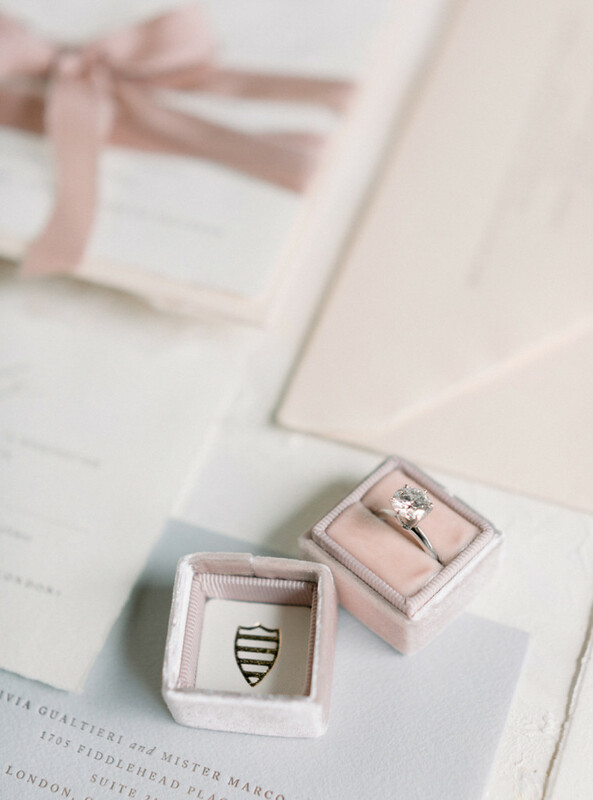 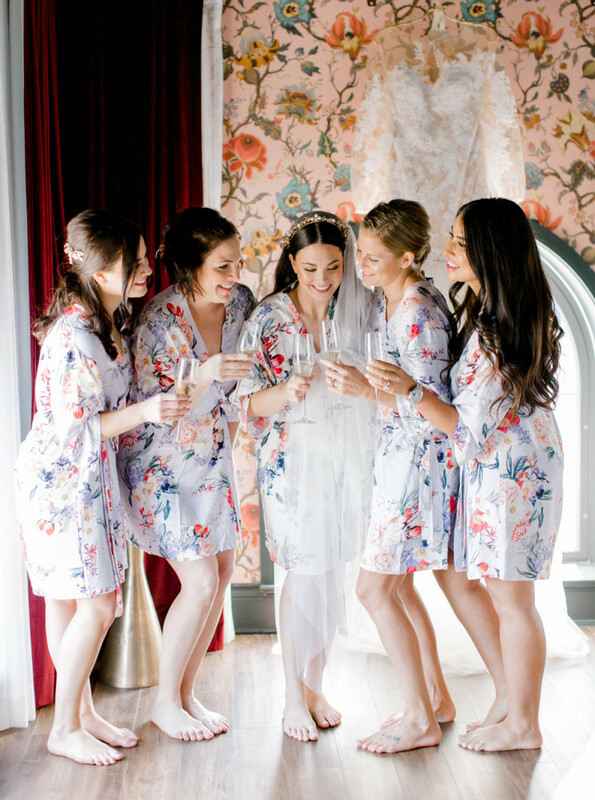 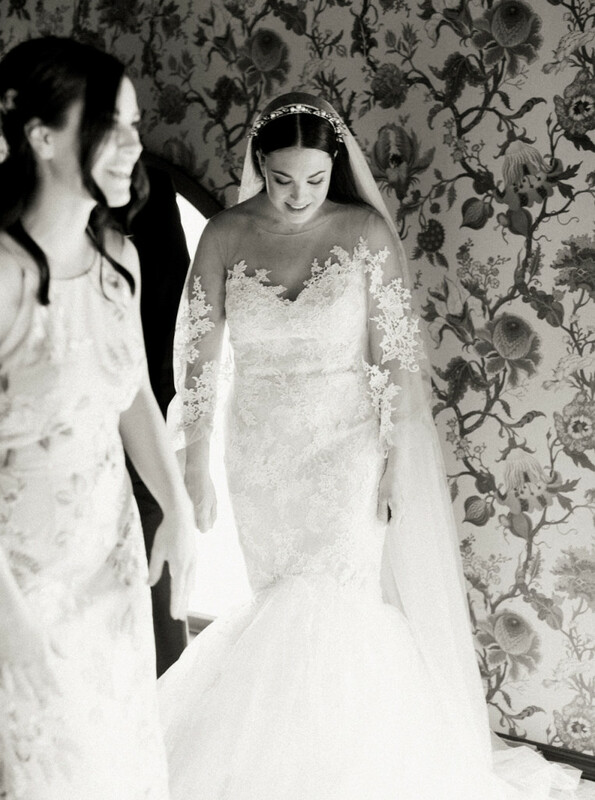 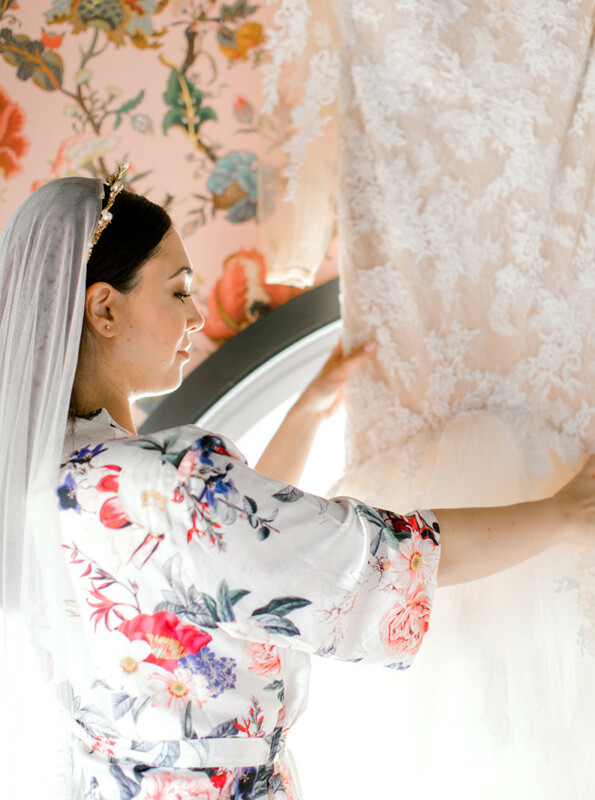 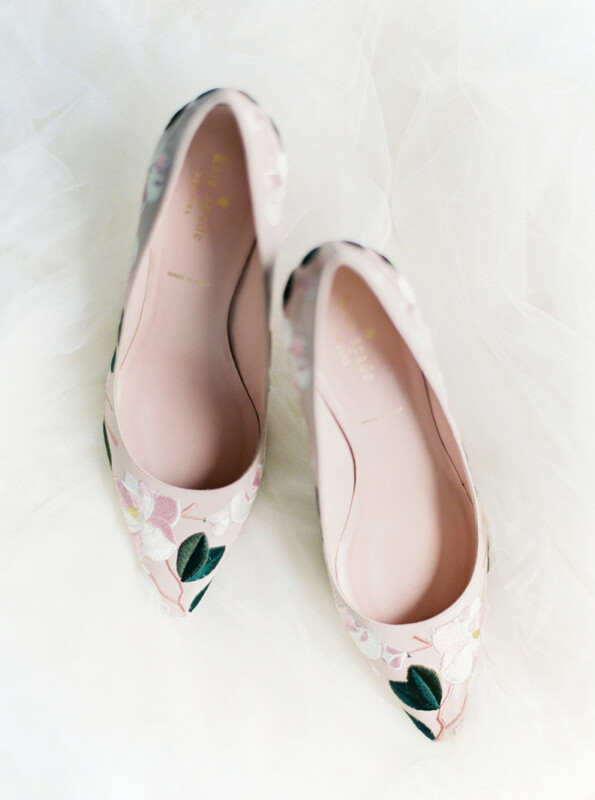 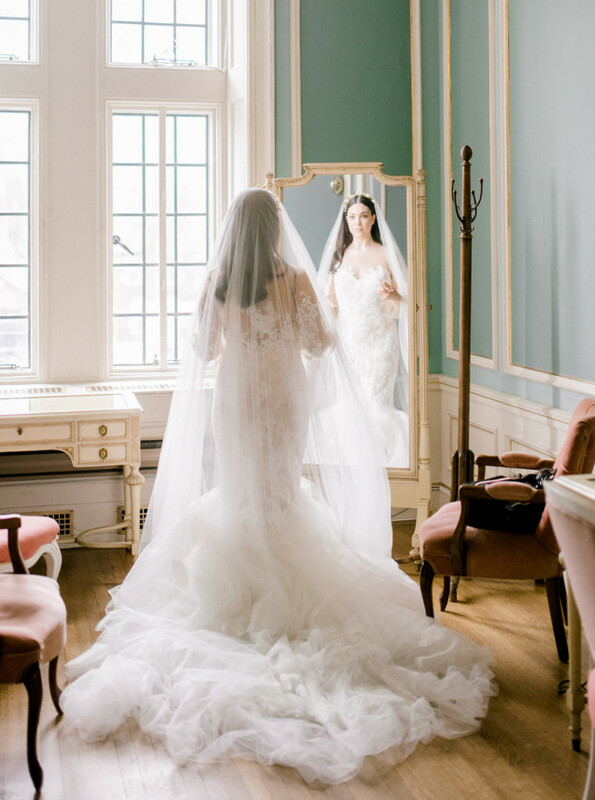 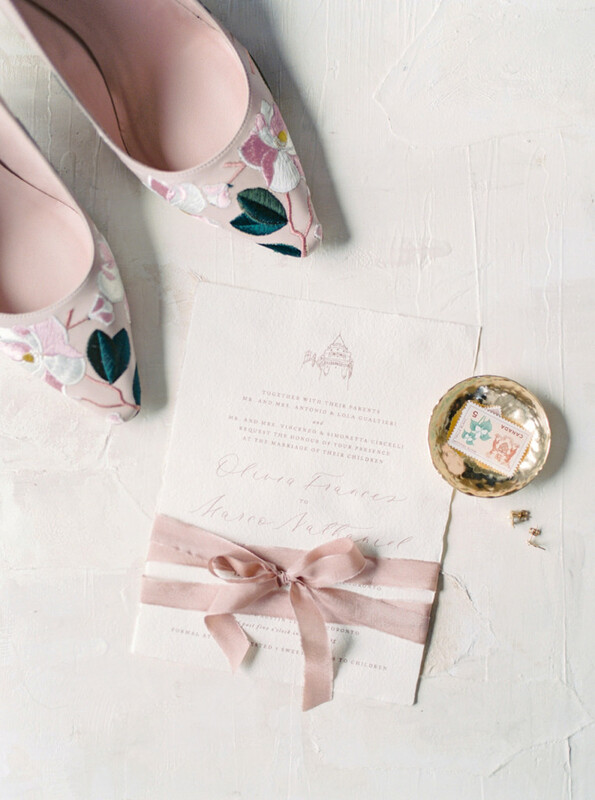 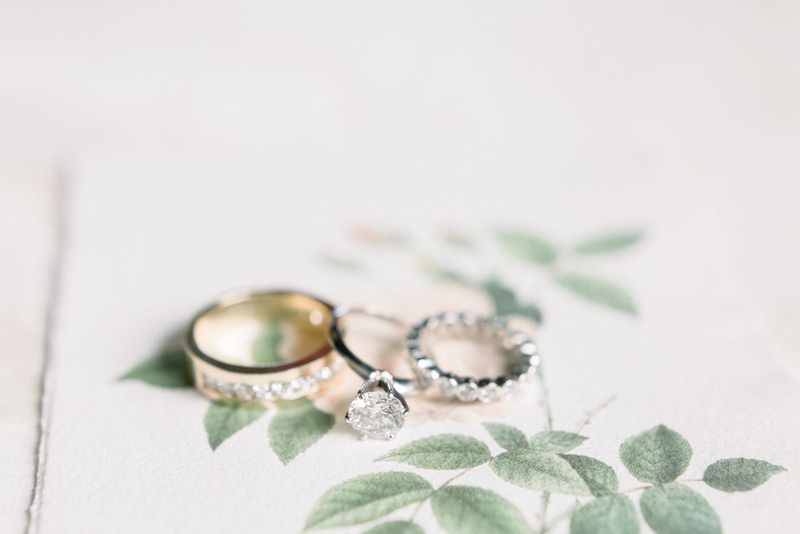 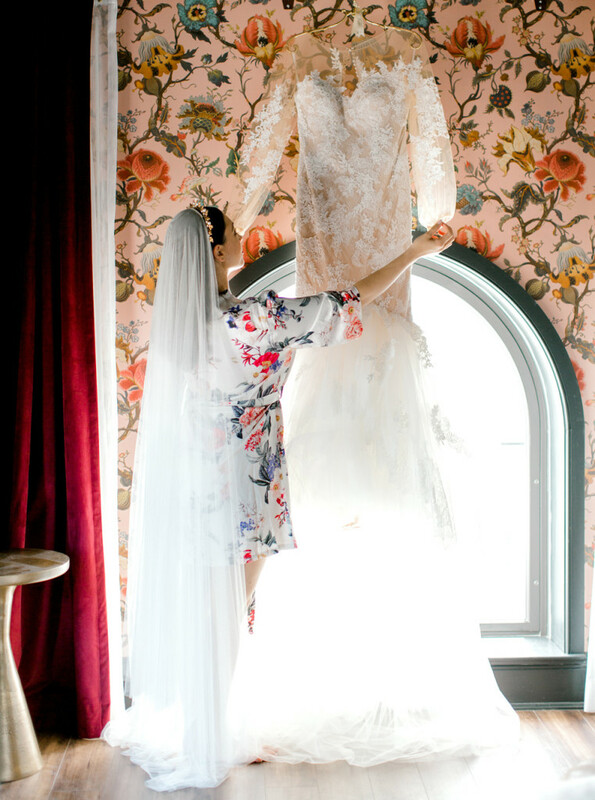 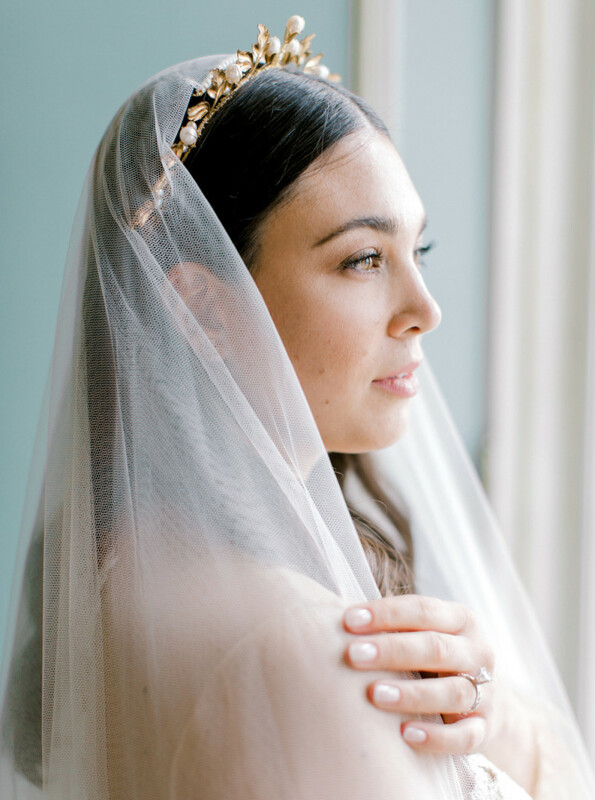 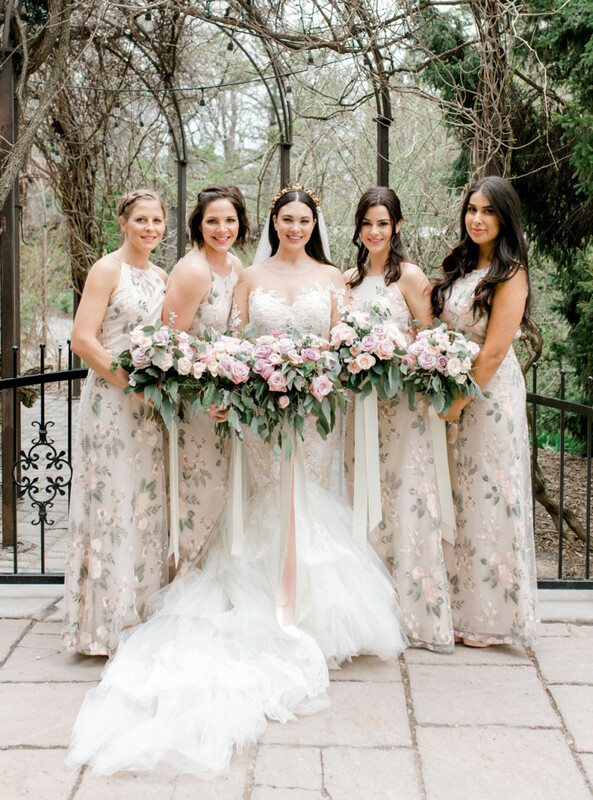 As she had infused this into so many different avenues of the wedding (from the patterned walls of the boutique hotel she got ready at, the Jenny Yoo bridesmaid gowns, to her and her grooms shoes), we had no choice but to continue this theme throughout the stationery suite. 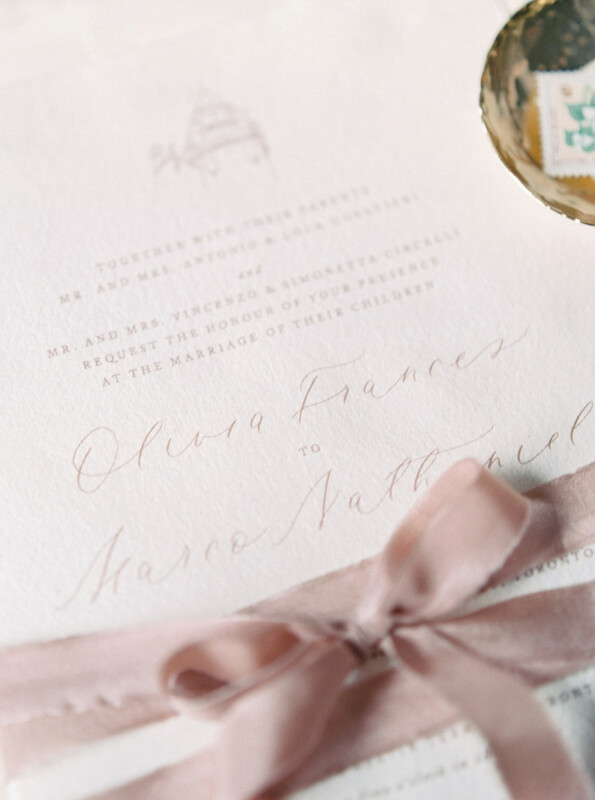 Olivia and Marco’s wedding invitations were printed on beautiful handmade paper, and featured a lovely traditional design. 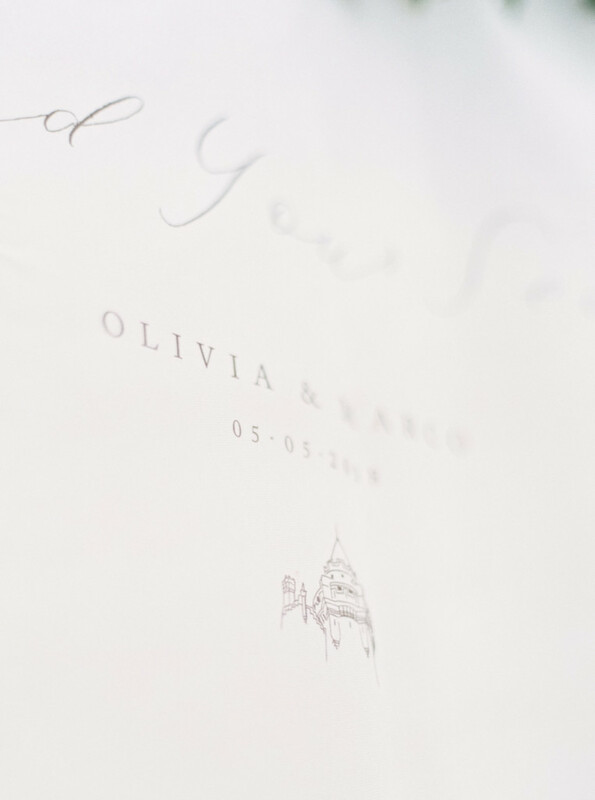 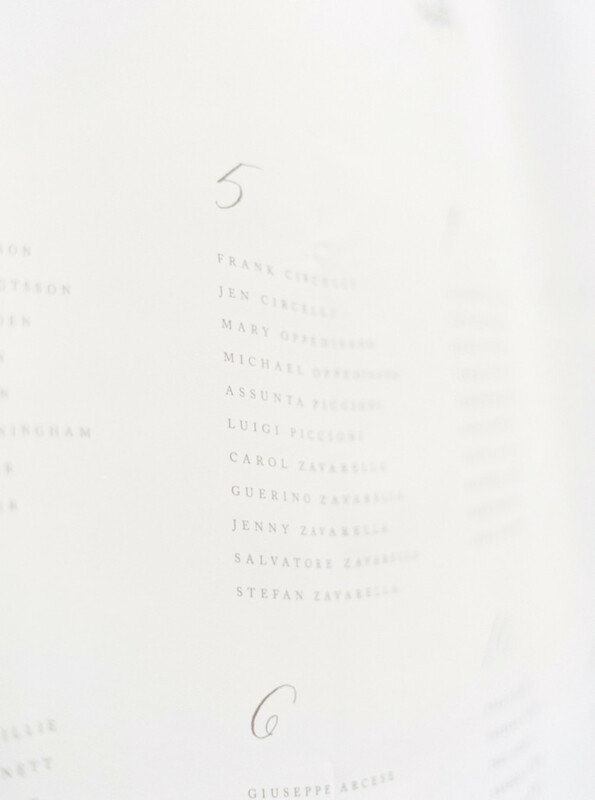 A custom sketch of a tower from their beautiful venue graced the tops of the invitations. 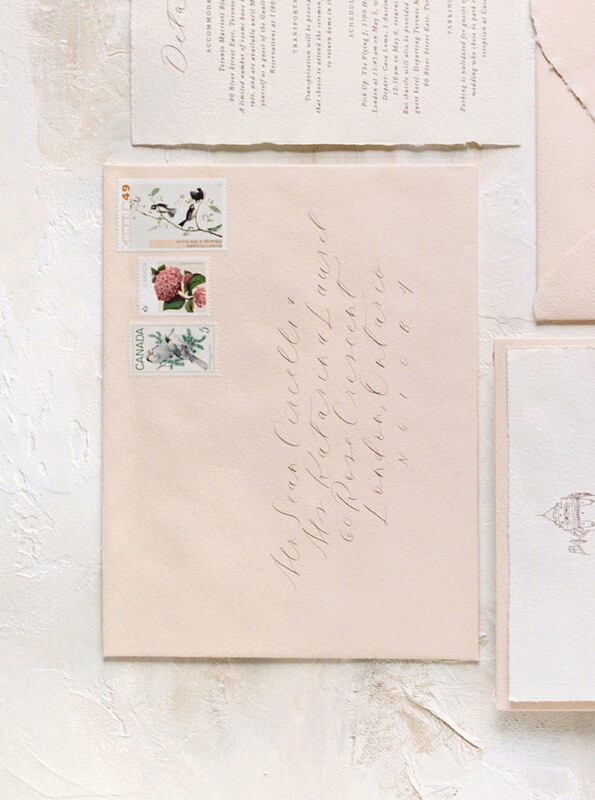 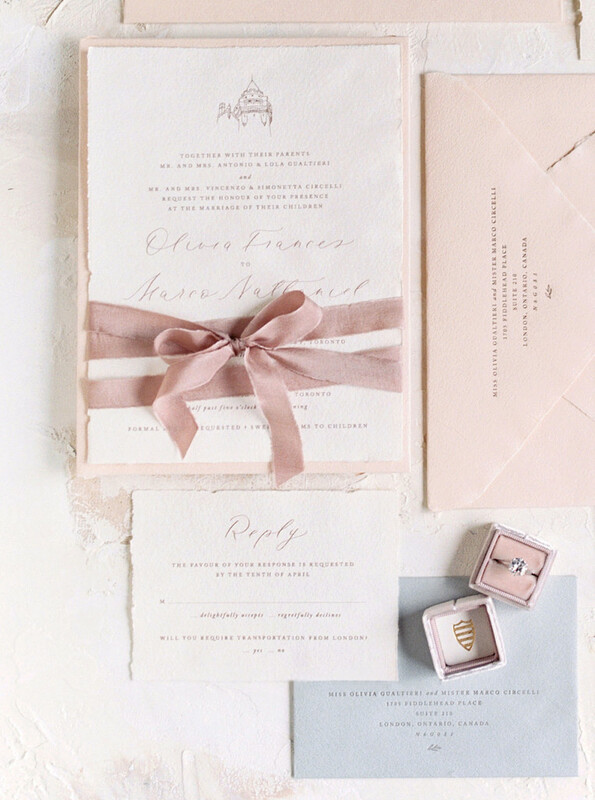 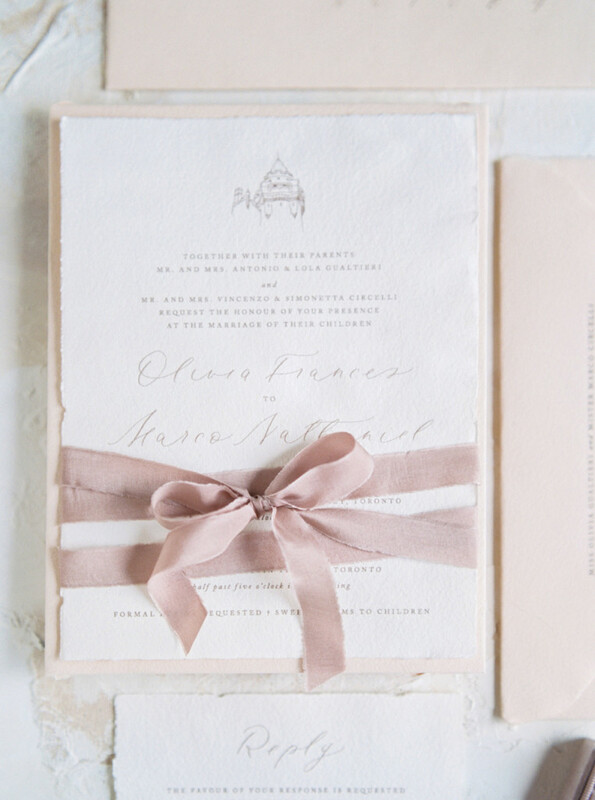 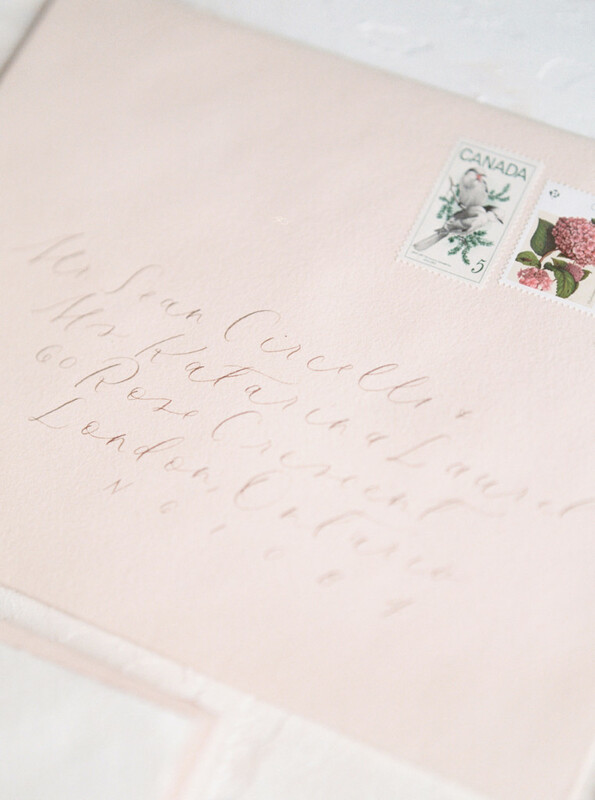 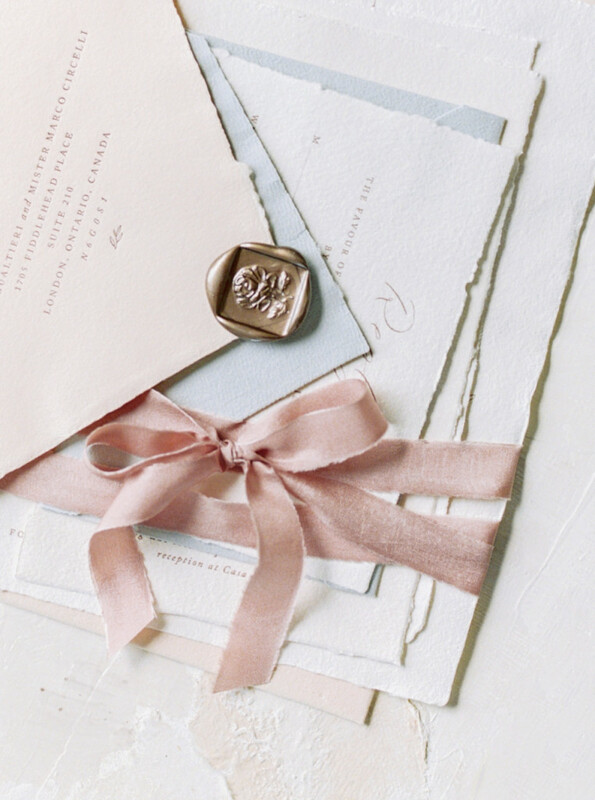 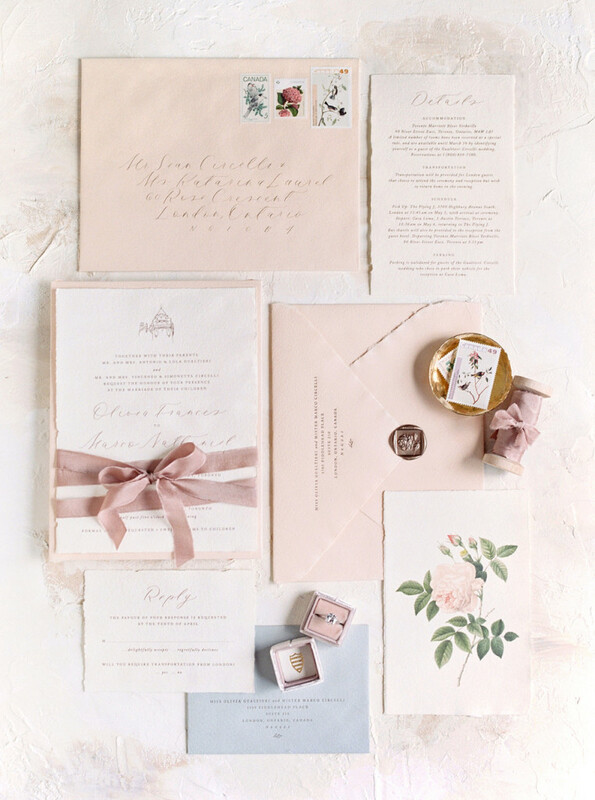 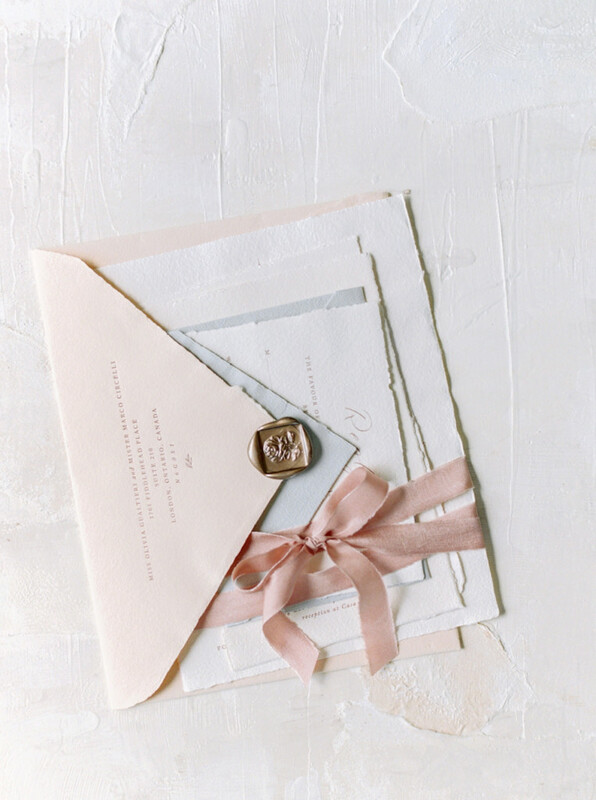 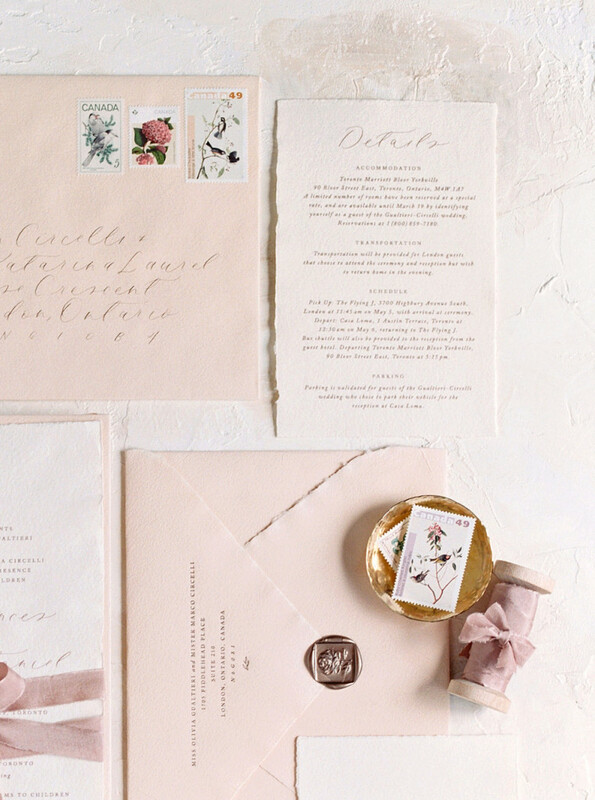 Handmade paper envelopes in muted blush and soft grey accented these formal invitations with letterpressed reply addresses. 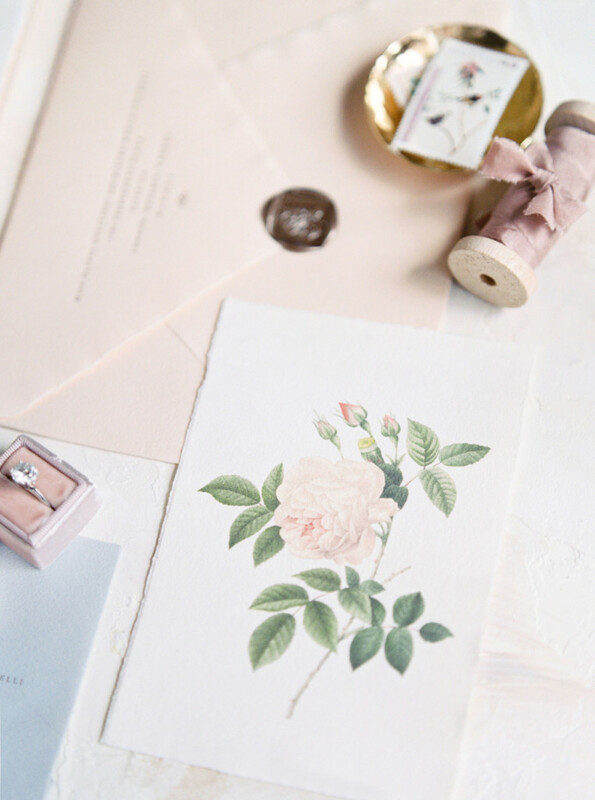 A special botanical print, featuring a painted rose served as a memorable keepsake and alluded to the couples’ upcoming theme. 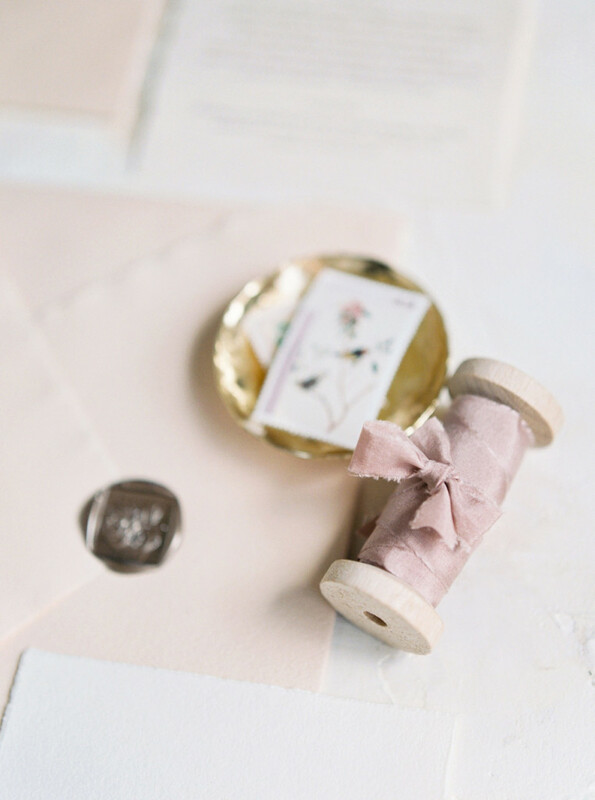 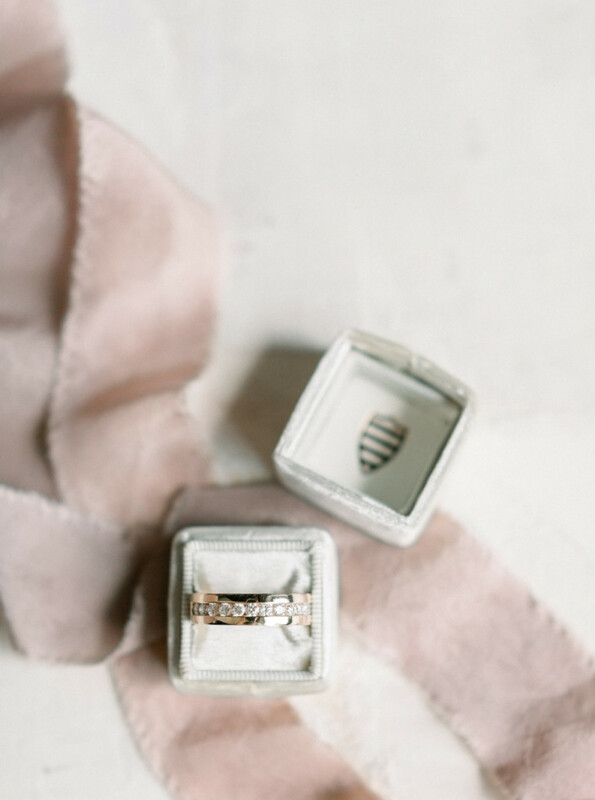 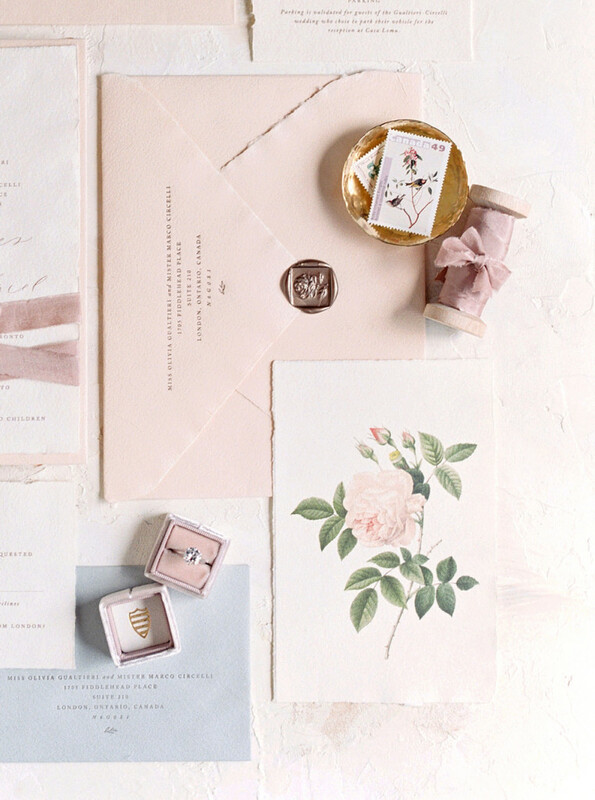 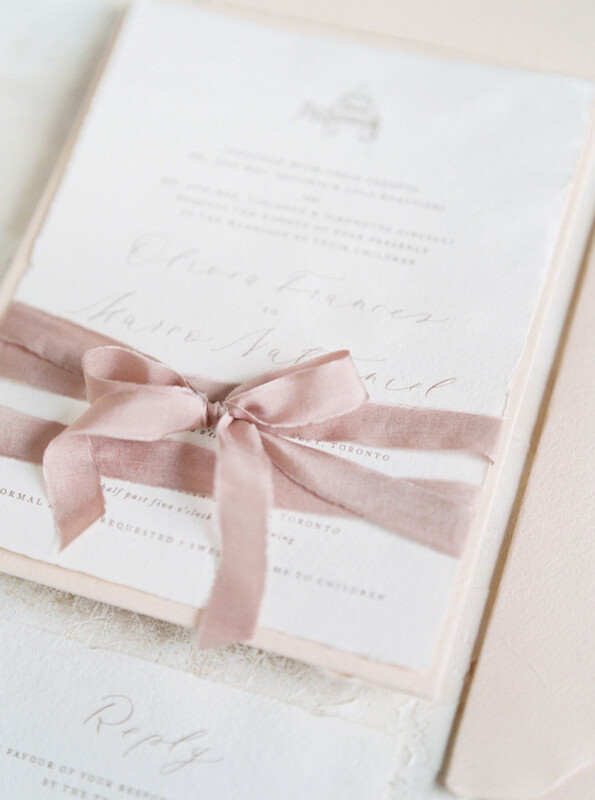 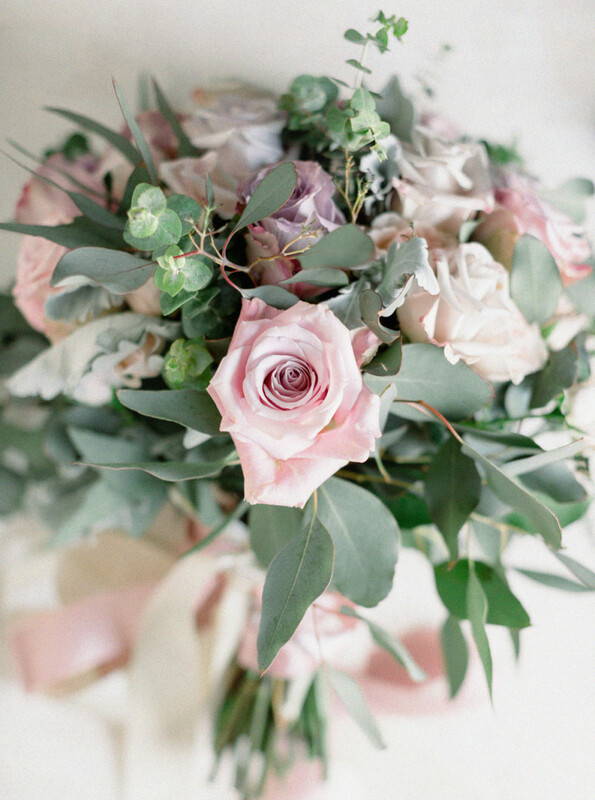 The suite was perfectly assembled with mauve-toned silk ribbon, creating the perfect package for guests to unpack. 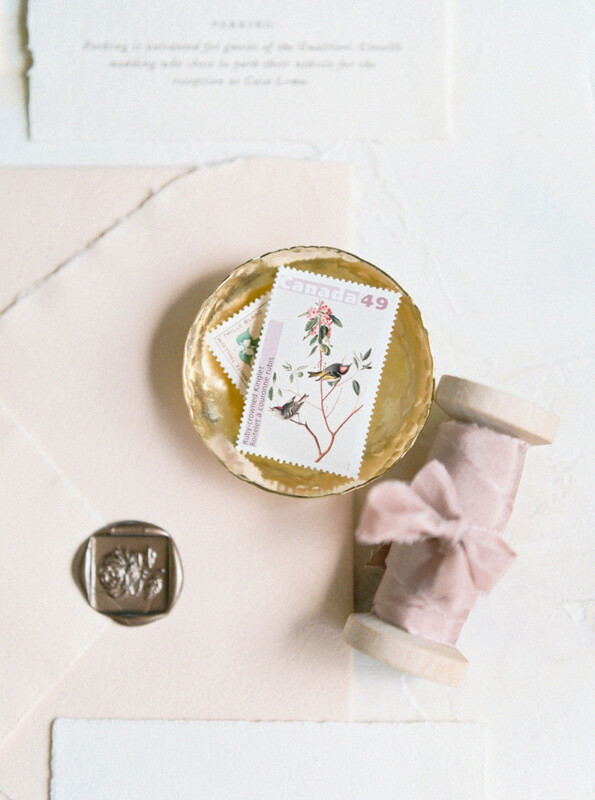 It was finished off with the most delicate calligraphy, vintage stamps showcasing Spring birds and florals, and finally a rich coloured rose flower wax seal. 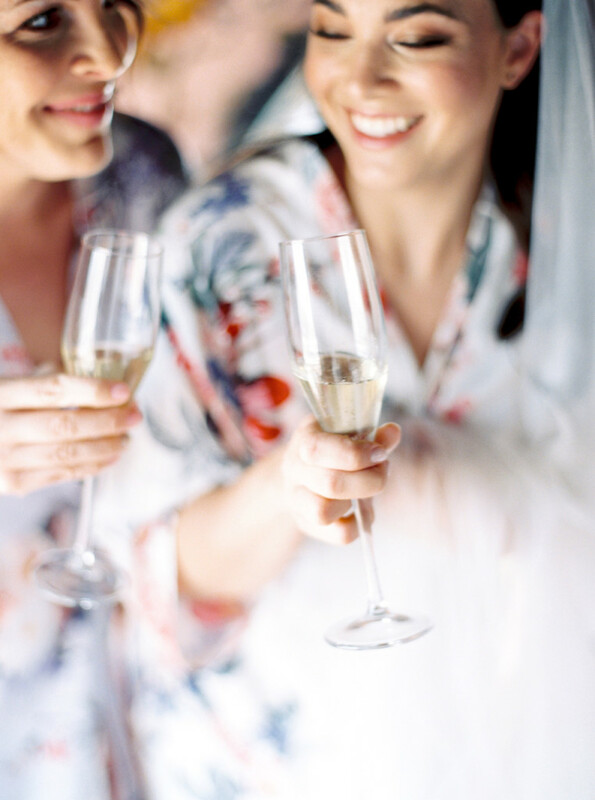 What a way to excite your guests for your upcoming nuptials! 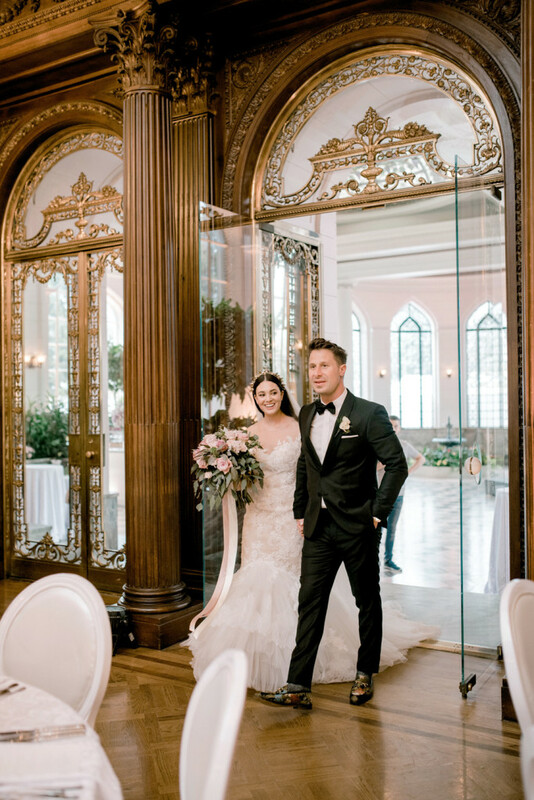 After the couples beautiful ceremony, guests entered the terrace at Casa Loma where they were greeted with specialty drinks and cocktail music. 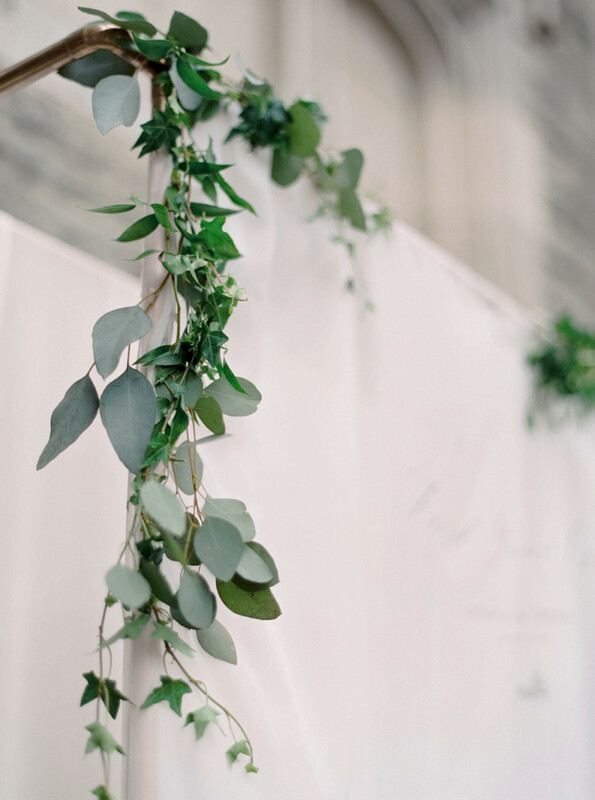 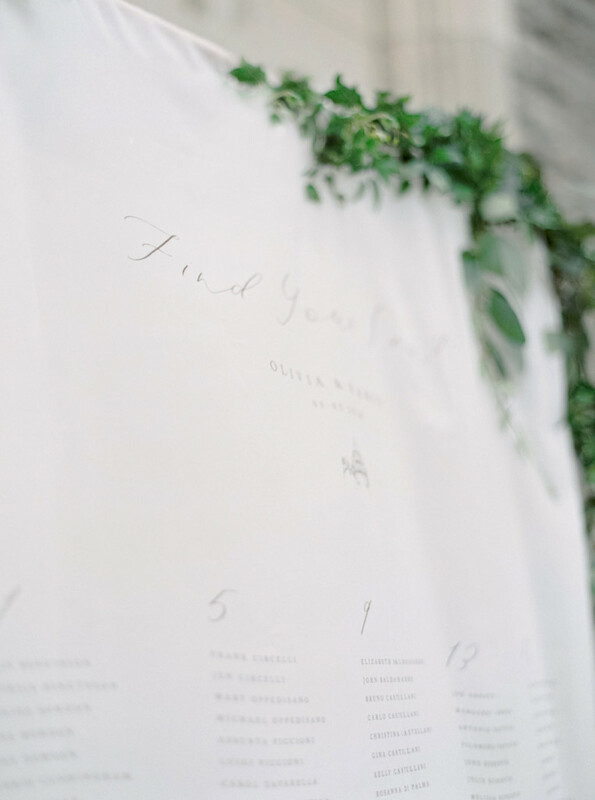 ‘Extra Dirty Vodka Martinis’ and ‘Classic Caesars’ were sipped as guests perused the chiffon fabric printed seating chart that was adorned with draping greenery. 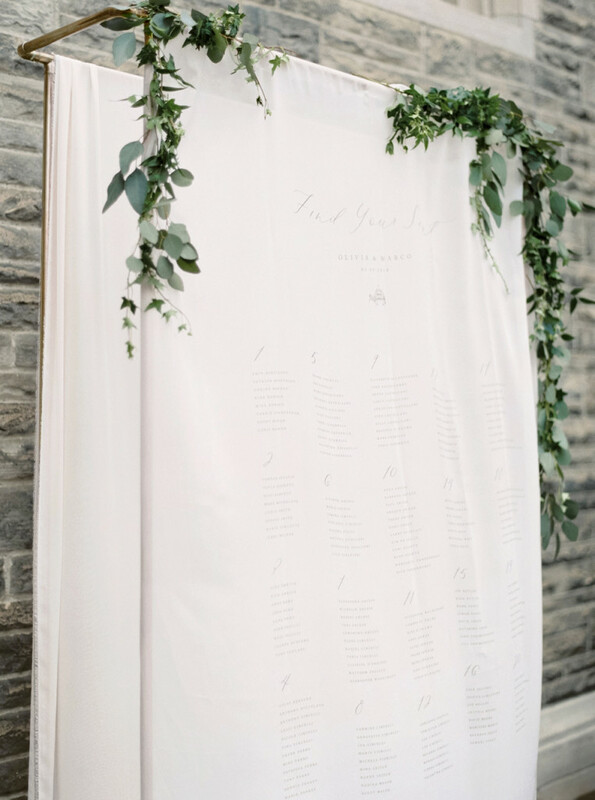 It’s always so nice when you can showcase fabric signage outdoors, so you get to witness the breeze giving it some movement! 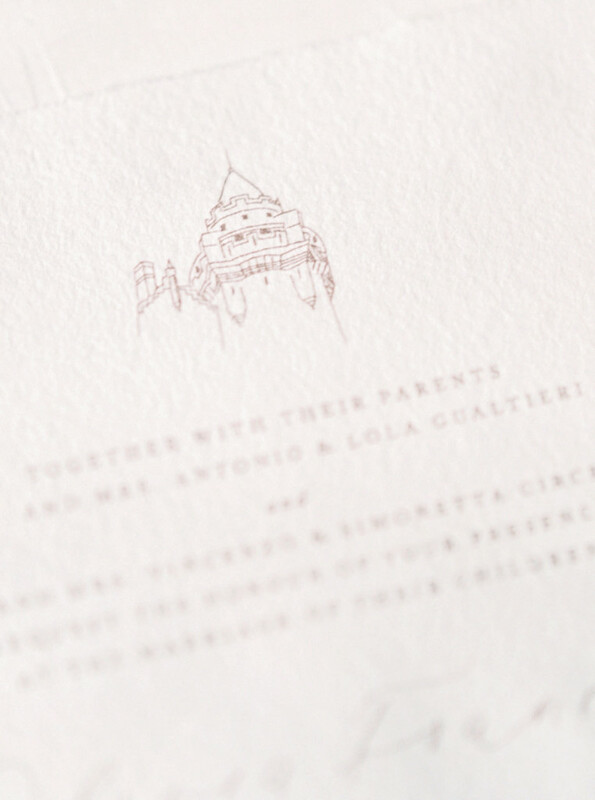 It was a simple design featuring the couples wedding date and their custom castle tower illustration that was used previously in their wedding invitations. 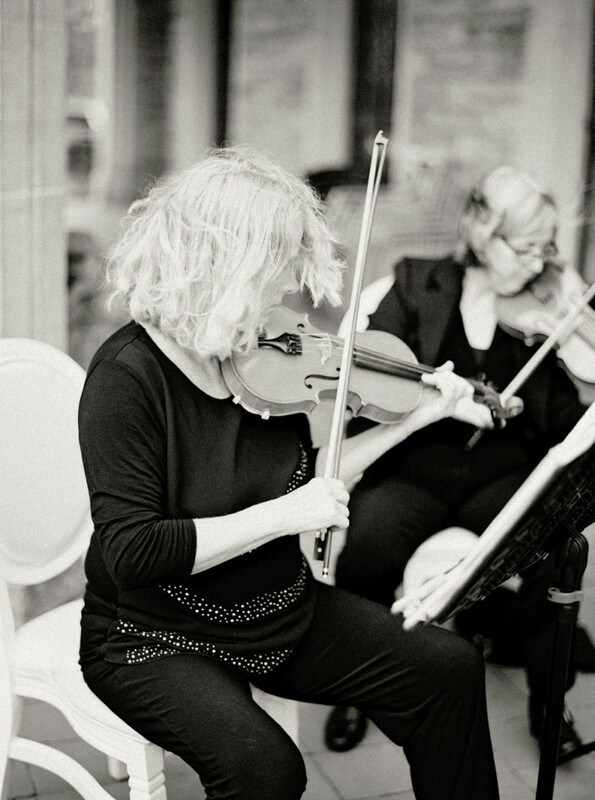 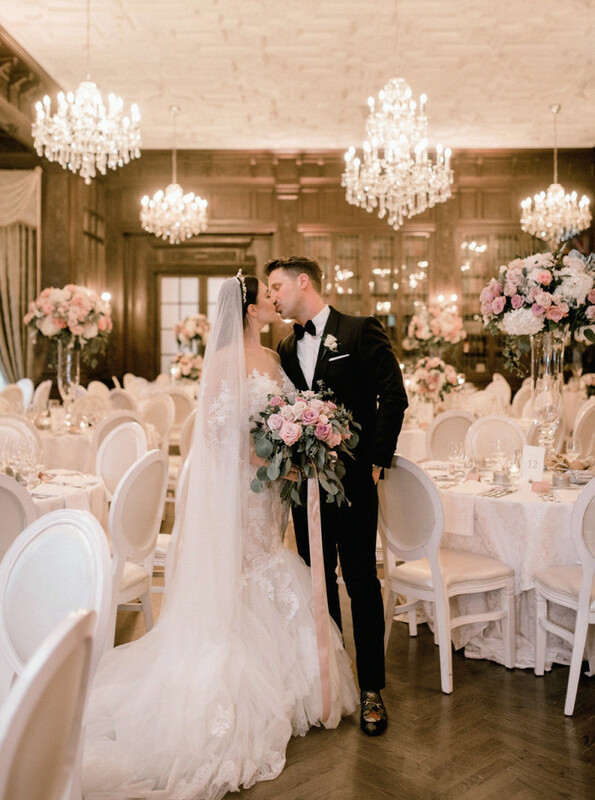 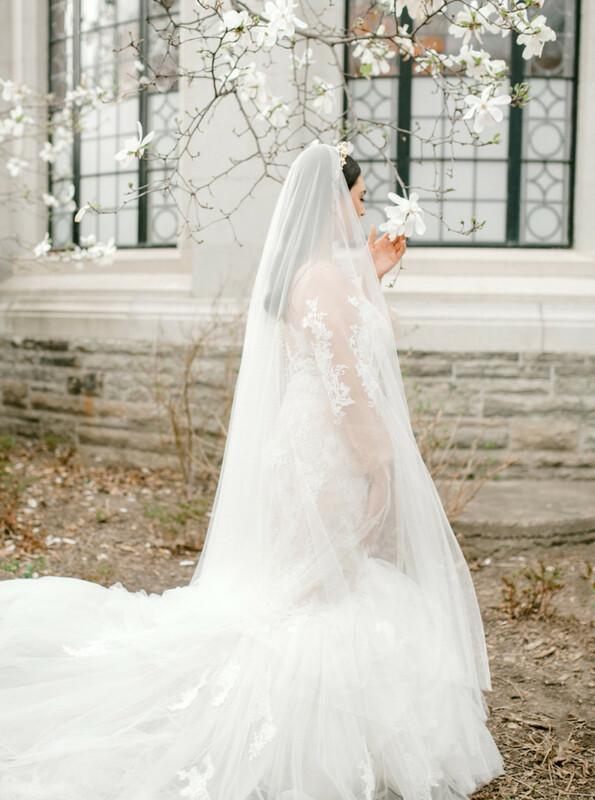 Olivia and Marco’s wedding reception was set in the library at Casa Loma. 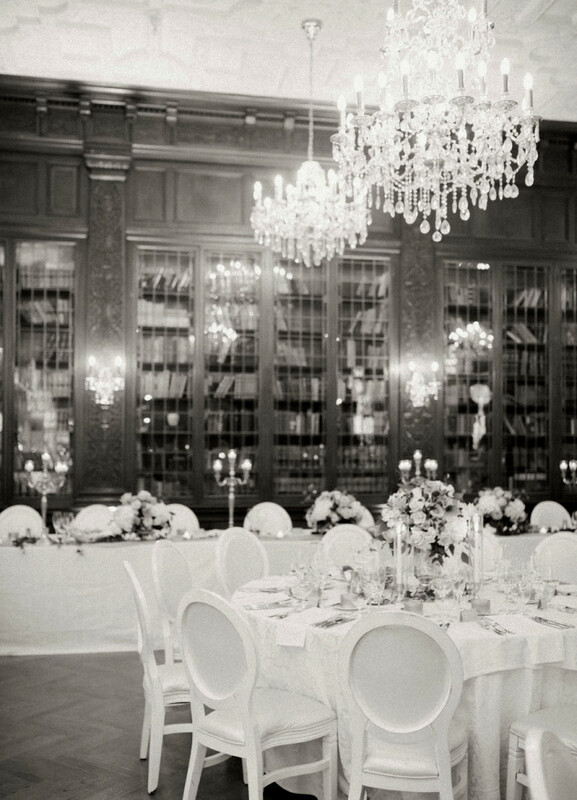 A grand room with high ceilings, ornate walls filled with an antique book collection, elegant chandeliers and views of the grounds and beyond. 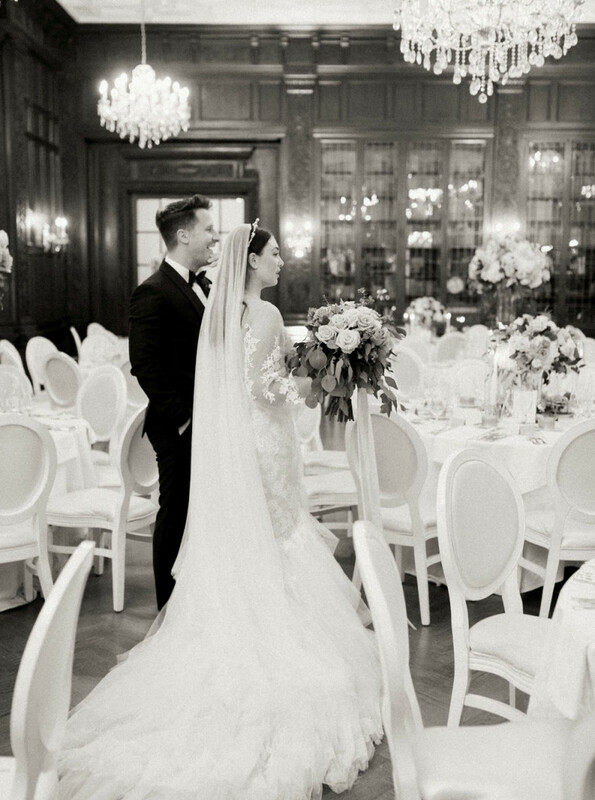 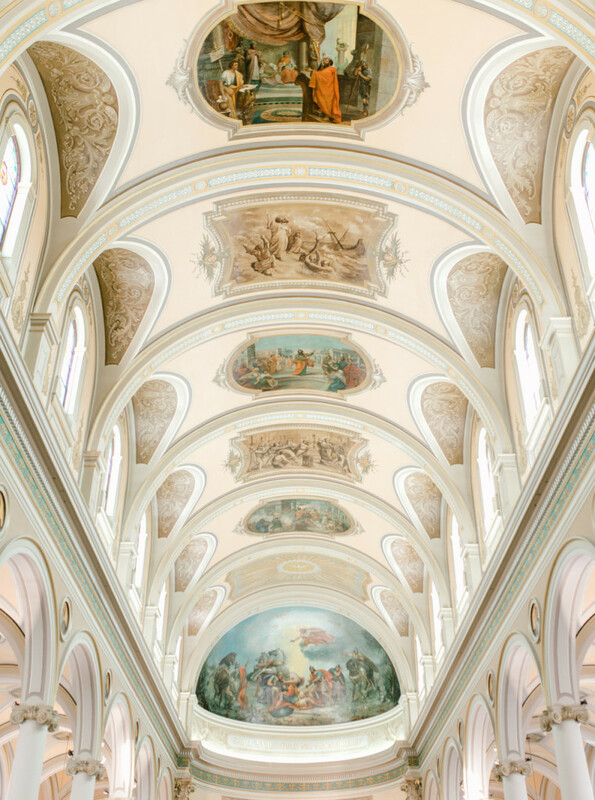 It was decorated beautifully as a thoroughly romantic space. 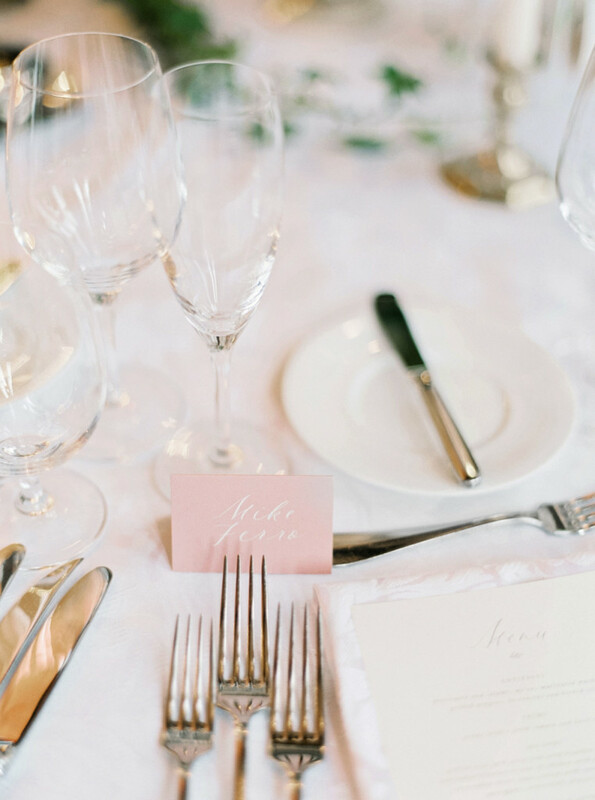 The tablescapes were simple, yet extravagant. 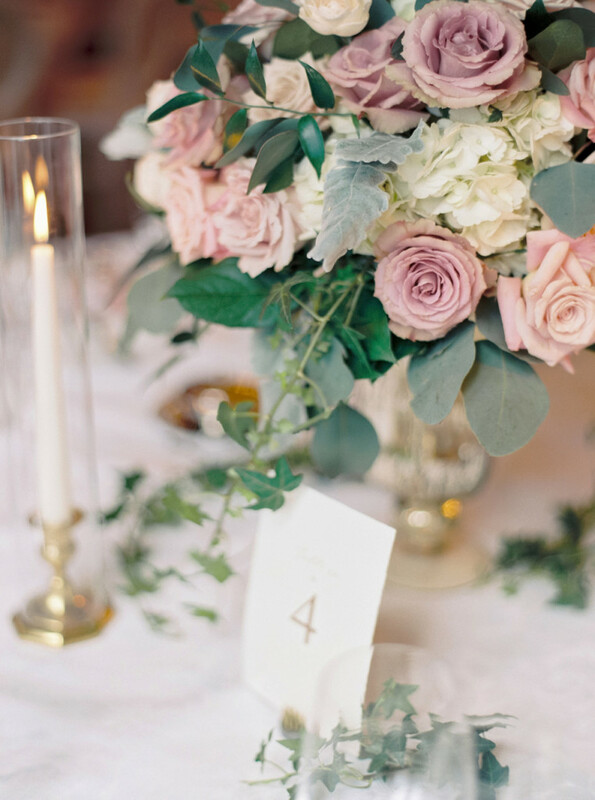 White linens with large floral arrangements, greenery and candlesticks filled the centres along with simple typographic table numbers. 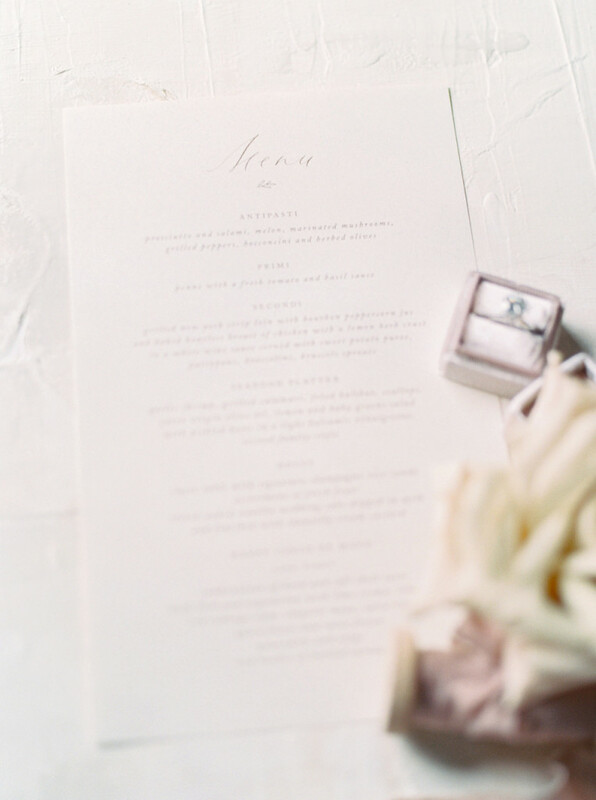 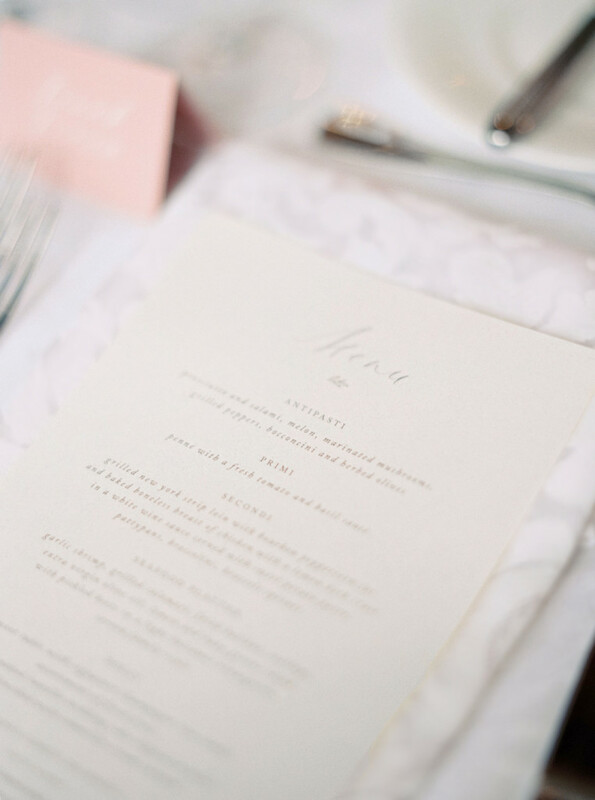 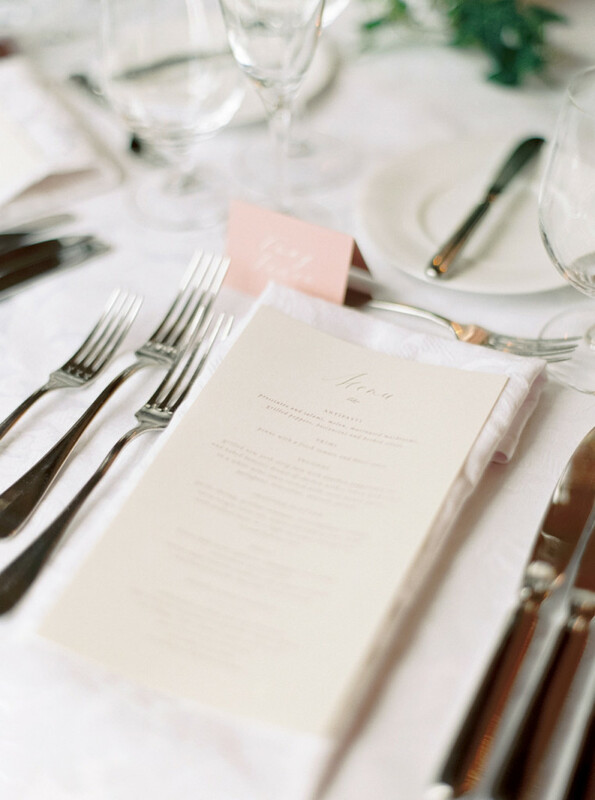 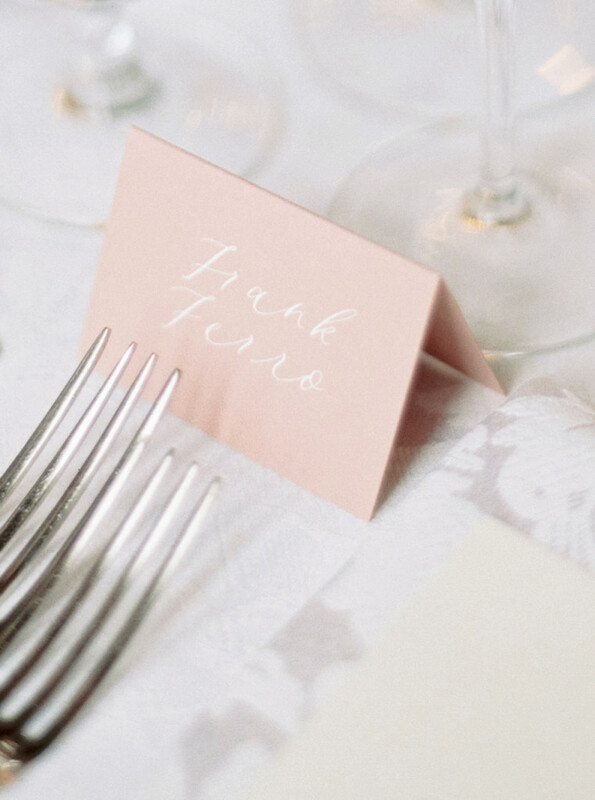 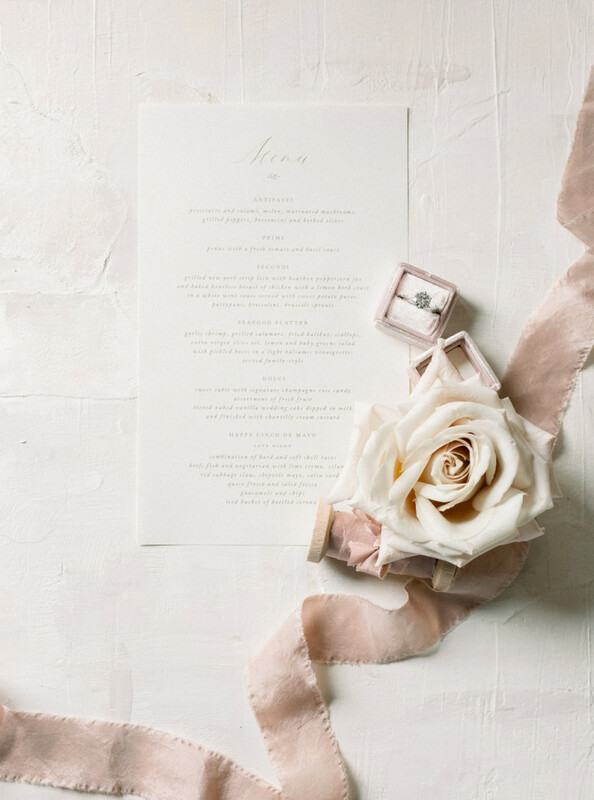 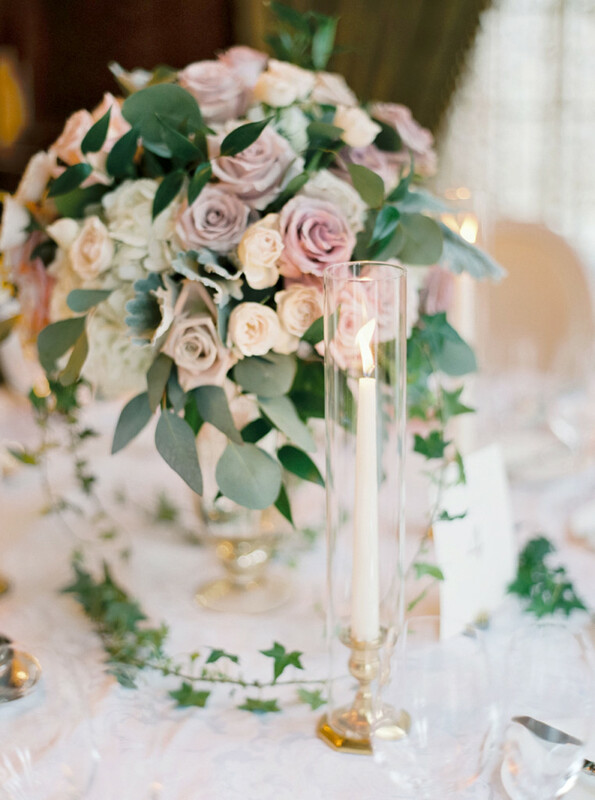 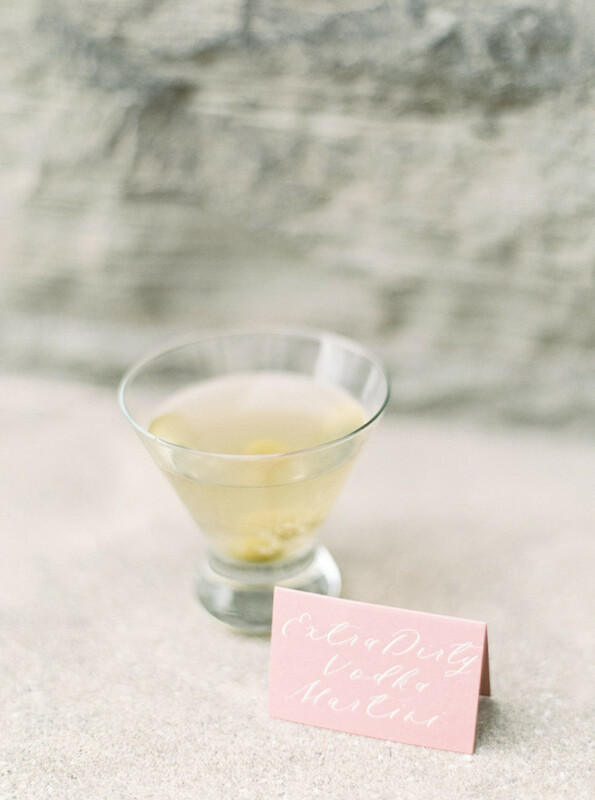 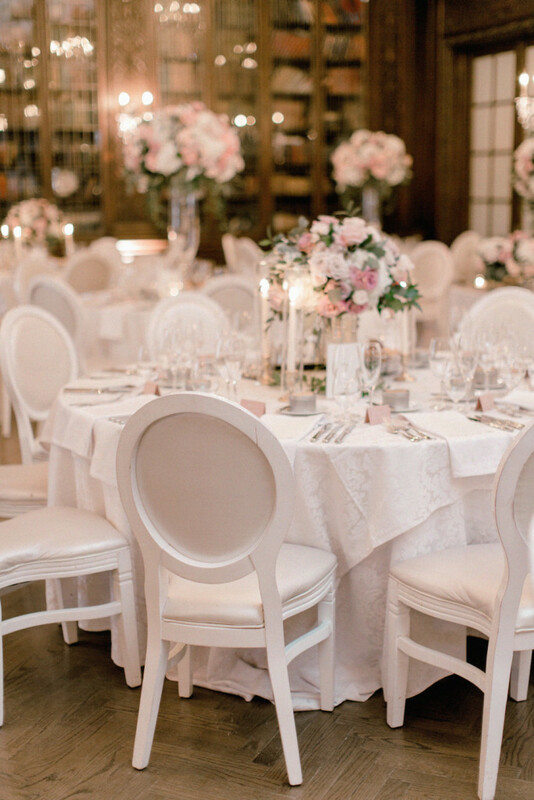 Menus were included in an ivory stock to excite their guests with the five-course meal ahead of them, and dusty rose toned place cards with their names in white calligraphy. 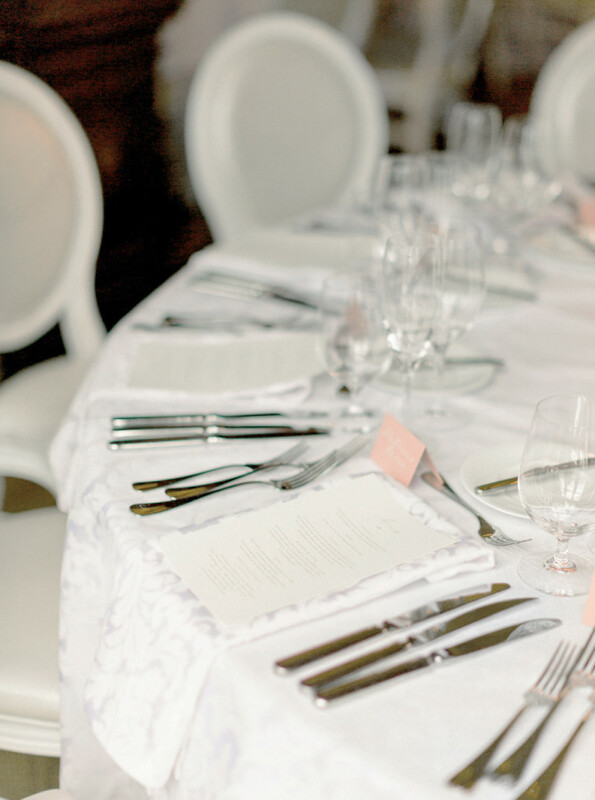 A big thank you to the wonderful team of vendors who worked tirelessly to pull off this event! 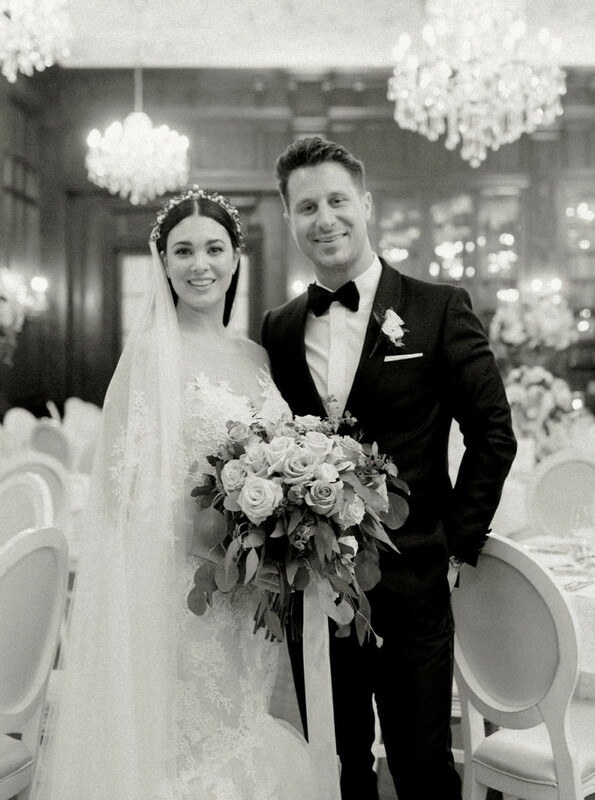 To watch their lovely wedding film, follow this link!